The final stop of my internship was Washington, DC where I gave two presentations to National Park Service employees. After arriving in DC, I met Cliff McCreedy, Marine Resource Managment Specialist for the NPS Ocean and Coastal Resources Program. Cliff walked me through my schedule for the next few days and helped me make final edits to my presentation. Thanks, Cliff for being so welcoming and helpful! I really enjoyed getting to know you. On Wednesday, I presented to ~25 employees who were gracious enough to give up their lunch hour to hear me speak about my internship. Sharing my experience with such a diverse group was extremely rewarding. 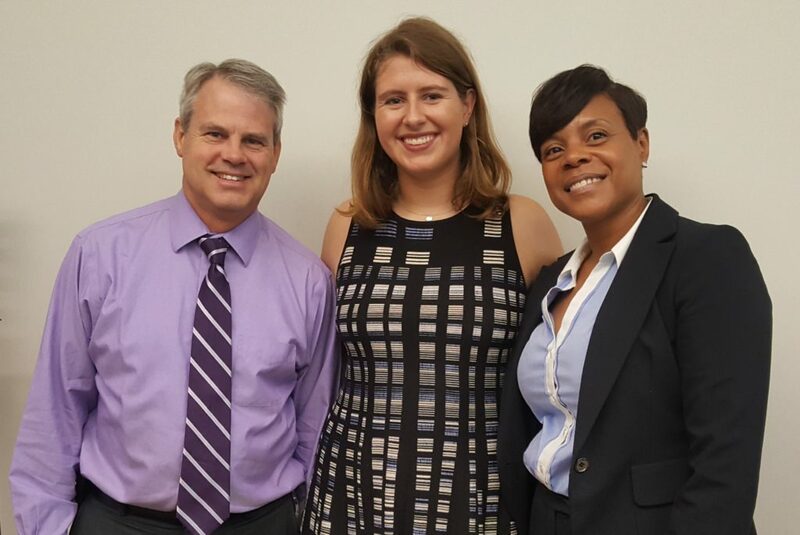 I gave my second presentation the following day to Raymond Sauvajot, Associate Director of Natural Resource Stewardship and Science, and Sonya Coakley from the Office of Visitor and Resource Protection (Public Health). This small setting gave me the opportunity to discuss my internship in more detail, and answer follow-up questions regarding each park. Thanks again, Ray and Sonya for coming to my presentation! It’s hard to express in words how amazing my summer was. I learned so much, met so many incredible people, and made memories that will last a lifetime. Thanks to everyone in the NPS who welcome me as the 2018 OWUSS NPS intern. And thanks to everyone who has followed my journey via this blog! I hope that in the future I can find a home again with the National Park Service. Next stop, King Abdullah University of Science and Technology (KAUST) in Saudi Arabia where I will be an MSc candidate in the Reef Ecology Lab! This entry was posted in 2018 National Park Service on November 19, 2018 by Shannon Brown. 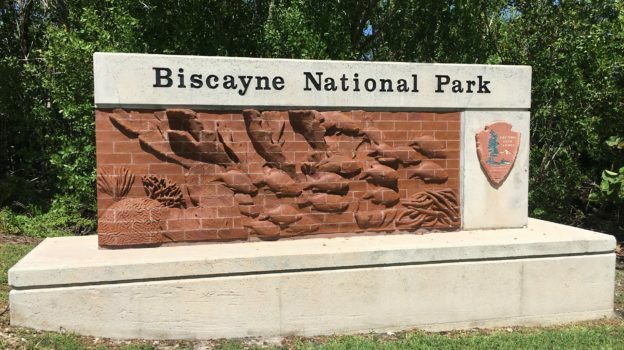 For the second time this summer, I pulled up to Biscayne National Park (BISC) with my bags in tow. For the last two weeks, archaeologists from BISC, the Submerged Resources Center (SRC) and the Southeast Archaeological Center (SEAC) had been documenting two sites with the help of colleagues from East Carolina University, University of California Santa Cruz, and Cheikh Anta Diop University in Senegal. This archaeological work would not only provide detailed maps of these two previously undocumented sites, but it also gave the NPS the opportunity to run a field school for their visiting colleagues. 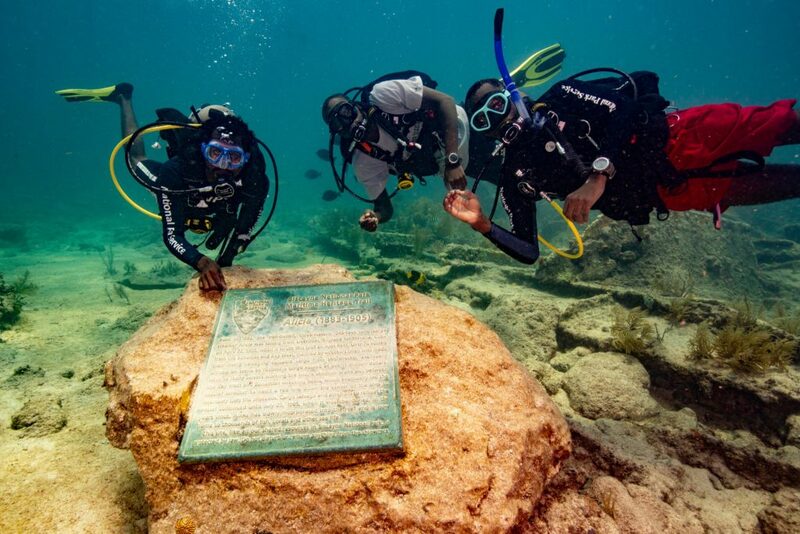 This work at BISC was in coordination with the Slave Wrecks Project, a program which works to research, train, and educate with a focus on the global slave trade. Collaborators of the project include Smithsonian’s National Museum of African American History and Culture, George Washington University Capitol Archaeological Institute, IZIKO Museums of South Africa, the South African Heritage Resources Agency, Diving with a Purpose, SRC, and SEAC. Upon arriving, I was greeted by familiar faces as I helped offload the boats. Matt Hanks, an archaeologist for the SRC and the project lead, then introduced me at the day’s debriefing. That evening, after some excellent barbeque, I observed as Joel Cook (MSc at ECU) and the three Senegalese students (Laity, Djidere, and Adama) added new drawings to the Boxcar sitemap. While observing, Joel explained the mapping procedure. For each flagged object, a mud map (i.e. a rough sketch with detailed dimension measurements) is drawn. These measurements are used on land to more accurately construct the object. 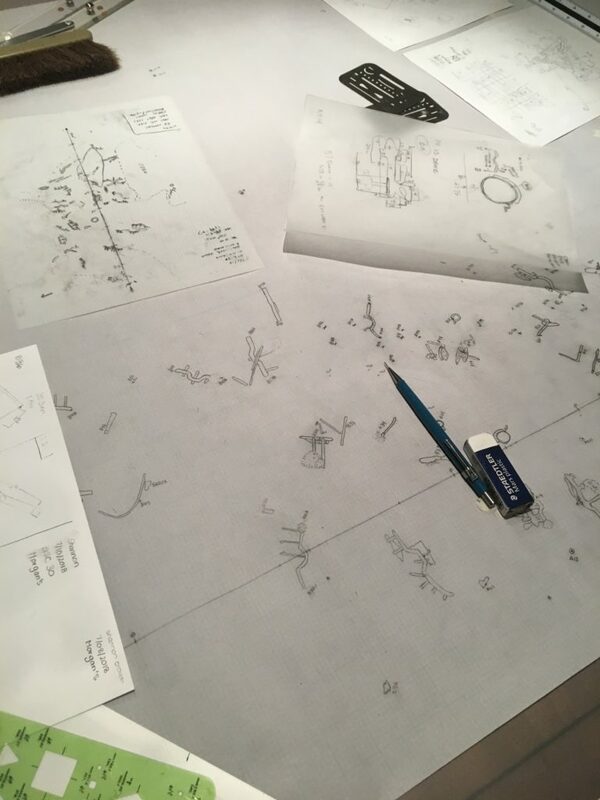 Once resized, the object is transferred to mylar paper and sketched on the larger map. On Saturday morning, we rose early and headed to BISC to begin our day of diving. On our first dive, I accompanied Tara Van Niekerk, a Ph.D. student from ECU, as she collected some measurements at the Boxcar site. This shallow, small site was surrounded by seagrass and crowded with divers as everyone worked diligently to get their measurements. Next, we traveled to Morgan’s Wreck, the other undocumented site, where Matt gave me and all unfamiliar with the site a tour. Much larger than Boxcar, Morgan’s Wreck is located at about 30 ft and provides divers more room but also gives them more artifacts to sketch. My day ended with a trip to Pollo Tropical, a must-visit according to several members of the SRC crew. The next day, I accompanied Matt and Jessica Keller, an archaeologist for the SRC, on three dives at Morgan’s Wreck. 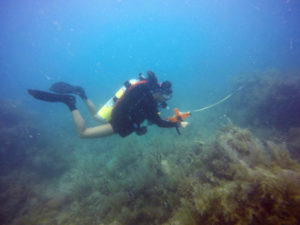 While underwater, I assisted with measurements and got the chance to sketch my own object. Without any maritime archaeology experience, my first sketch of a simple box was awful. 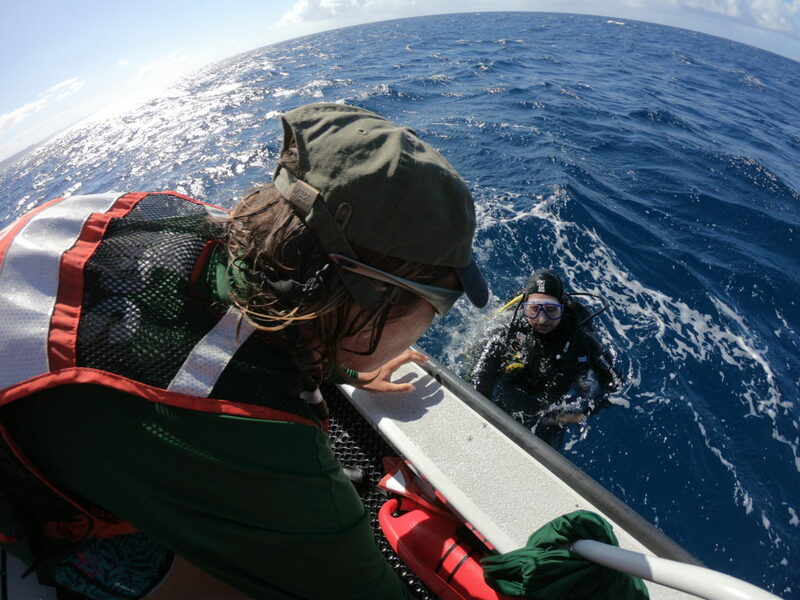 After each dive, I would ask Jess and Matt questions before returning to my box on the subsequent dive. Finally, by the last dive, I had adequately taken measurements from an aerial view (i.e. only width and length), and I had used a compass heading rather than angles to orient my object to the baseline. A baseline is a line that runs along the “middle” of the site and is used to orient objects at the site. The baseline is made of a strong cave line with a tape secured alongside. On Monday, we took the opportunity to catch up on mapping and determine what drawings were missing. At each site, numbered flags were placed on each object. Therefore, we were able to determine which points were missing. Excited to draw my simple box, Charlie Sproul, an archaeologist from SEAC, explained the dimensions of the map and how I should go about transferring my object. At that moment, I realized I incorrectly measured again. To orient an object on the map, we used two types of measurements from the baseline. When objects are close to the baseline, baseline offsets are utilized. For this measurement, a tape runs from the baseline at a 90-degree angle to the object. Trilates are when two measurements are taken from a single point on the object to two separate points on the baseline. The length of the tape and location on the baseline is used to determine the position of the object relative to the baseline. Often trilateration and offset measurements are taken before an object is drawn by using the numbered flag as a measurement point; therefore, the diver sketching the object must label the location of the flag on their object…something I neglected to do. Ready to correct my drawing, I headed out with Jess, Joel, Charlie, and Arlice Marionneaux, an American Conservation Experience intern at BISC. After a day full of more diving and more measuring, I was excited that I finally had all the necessary information to add my box to the map. Over the past few days, with trial and error, I had learned a lot. I developed a massive appreciation for maritime archaeology and enjoyed assisting the group over the next few days as they worked to finish the mapping at Morgan’s Wreck. In addition to our normal crew, while at BISC, we were accompanied by a team of filmmakers who were working on a slavery documentary. While their film is still in the early stages, I got the opportunity to observe document filming first hand, both above and below water. During my week, I also got the opportunity to play with my camera and capture the gorgeous organisms that populated the area around Morgan’s Wreck. After completing a majority of the mapping, some of the group shifted their priority to jumping anomalies. 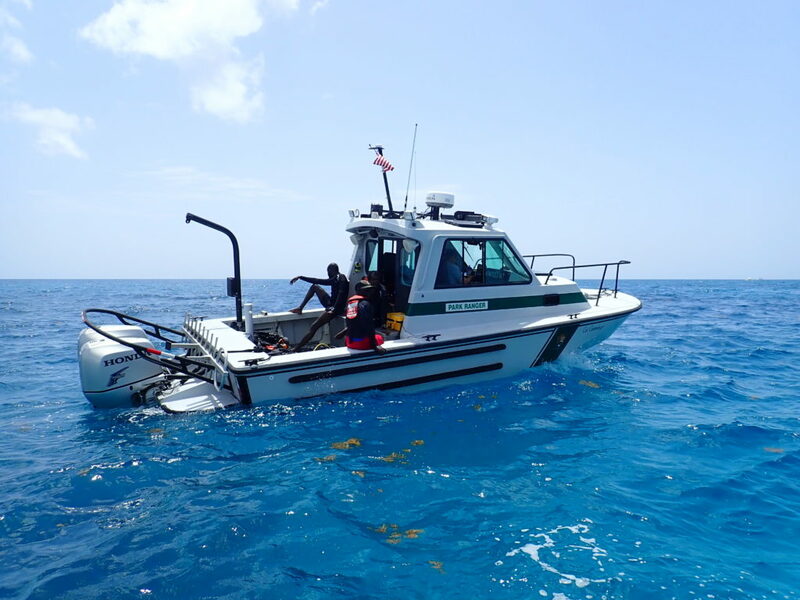 Last year, in association with the Slave Wrecks project, the NPS dragged a magnetometer around a large portion of BISC’s marine habitat in search of the Guerrero, a Spanish pirate slave ship that wrecked in the Florida Keys. In 1807, Britain and the United States both passed legislation to end the slave trade; however, slavery was still legal in the United States. The heavily armed Guerrero would attack other slave ships and forcibly transfer the Africans to their boat so they could sell them for profit. In 1827, while patrolling for slave ships, the HMS Nimble, caught sight of the Guerrero. The fight ended with both ships running aground. Tragically, 41 enslaved Africans were killed when the Guerrero sunk, while hundreds of survivors were recaptured and transported to Cuba to be sold into the slave trade. For more detailed information, check out this video which was produced through a partnership between the NPS SRC and Curiosity Stream. During their search for the Guerrero, the group identified over 1,200 anomalies. When the magnetometer was pulled across the ocean surface, the GPS coordinates were recorded when the device sensed iron. While iron can be found on wrecks, it can also be found on anchors, lobster traps, and other marine debris. To examine these anomalies, we traveled to these GPS coordinates, dropped a buoy with a weight, and then completed snorkel or diving surveys to determine what triggered the magnetometer. We spent around 10-20 min at each spot, depending on visibility. If we discovered anything of significance, a picture was taken, and a detailed description was recorded at the surface. At 1 of 12 anomalies checked on Thursday, Bert Ho, a survey archaeologist for the SRC, and I found a large piece of wood with nails. Yes, that was the most significant find out of all twelve anomalies jumped that day! While it seems trivial, jumping anomalies was awesome. 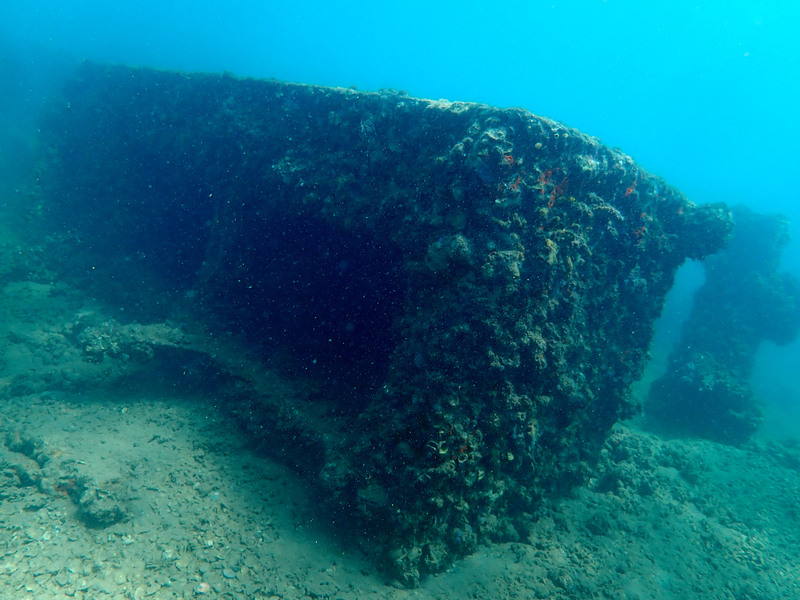 Not only did you get to experience different dive sites around BISC, but there was always the small hope that you would stumble onto an undiscovered wreck. After another day of anomaly jumping and a lovely day off, I was fortunate enough to spend my Sunday with Ronnie Noonan, the 2018 OWUSS REEF Intern. 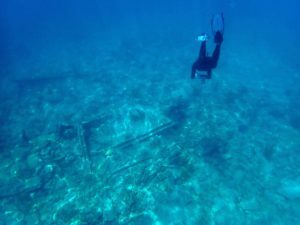 Based out of Key Largo for her internship, Ronnie was able to accompany Joel, Jess, Dave Conlin, Chief of the SRC, and I as we visited several wrecks in BISC. Blessed with spectacular weather, we explored four sites along the Heritage Trail. Joel took the time to point out significant ship structures to Ronnie and I. 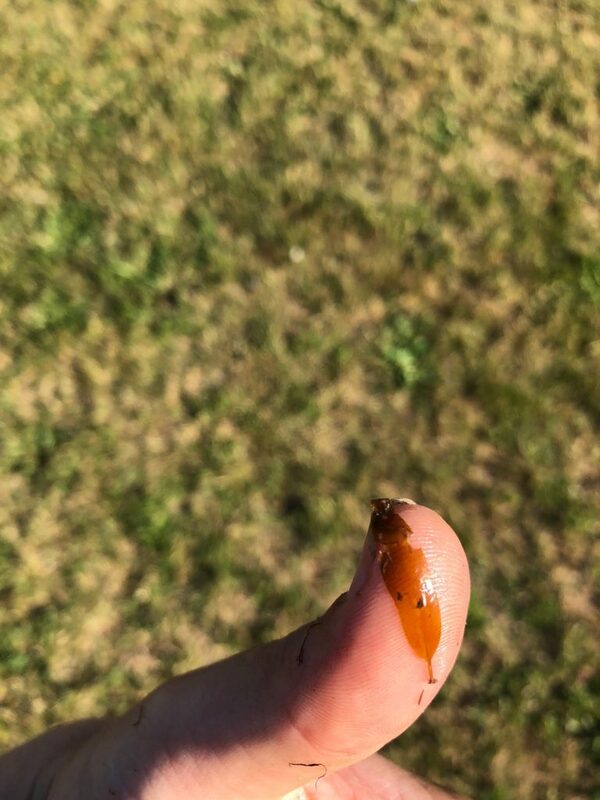 In addition, with Ronnie’s assistance, I got the opportunity to test my fish identification skills. 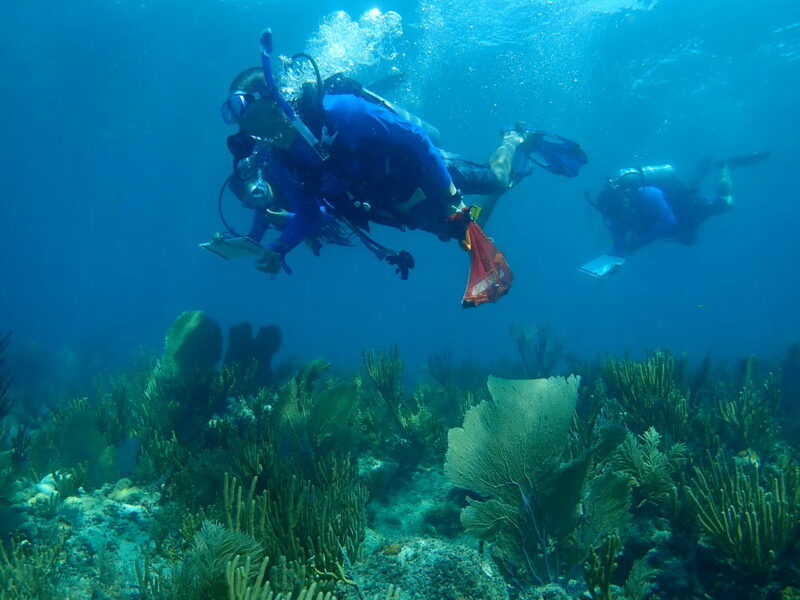 Having been trained to do REEF surveys in Bonaire, I was excited to try my hand in Florida waters. Not only were my fish ID skills a little rusty, but identifying fish while snorkeling made the process far more difficult. 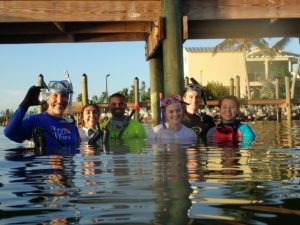 That evening, after a lovely day on the water, I accompanied Dave, Joel, and Arlice at the welcome barbecue for Youth Diving with a Purpose (YDWP). 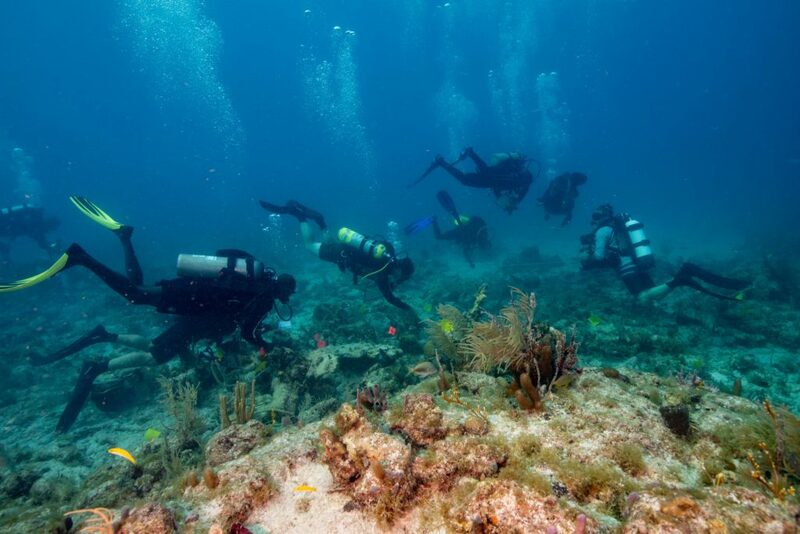 YDWP is a nonprofit organization that works to teach students about ocean conservation and maritime archaeology. As an offshoot of Diving with a Purpose, one of their focuses is the maritime history and culture of African Americans. For the final days of my internship, I would be assisting YDWP as they ran their maritime archaeology program at BISC. On Monday, we assisted YDWP with their archaeology coursework by setting up a mock wreck for the students to practice baseline offsets and trilates. While in Key Largo with YDWP, I was also fortunate enough to grab lunch with my friend, Lydia. She was an intern with me in Bonaire, and I was extremely excited that we got the chance to catch up. For the next two days, Arlice, Dave, Andie Dowell, Josh Marano (an archaeologist for BISC), and I traveled to an undocumented wreck in BISC and observed as the students practiced underwater mapping. With slates and tapes in hand, the students worked diligently to find objects, sketch them, and record their position at the site. In addition to helping YDWP, I worked alongside Dave to uncover artifacts with a metal detector. This site was discovered while jumping anomalies last year, and archaeologists need more information before determining whether or not the site is the Guerrero. Working with YDWP was a privilege. Not only did I meet a group of enthusiast students, but the instructors were clearly passionate about the underwater world as well. Thanks again Dave for allowing me to assist with this program for the final days of my internship! After drying my gear one last time and packing up my bag, I was ready to head home for a few days before traveling to Washington, DC. While in DC, I would present about my summer internship to various members of the National Park Service. Thanks to the members of the SRC, SEAC, and all their colleagues who were willing to teach a biologist some archaeology. I really enjoyed my second trip to Biscayne National Park. I got to participate in a project entirely out of my realm, and I had a spectacular time! This entry was posted in 2018 National Park Service on October 12, 2018 by Shannon Brown. 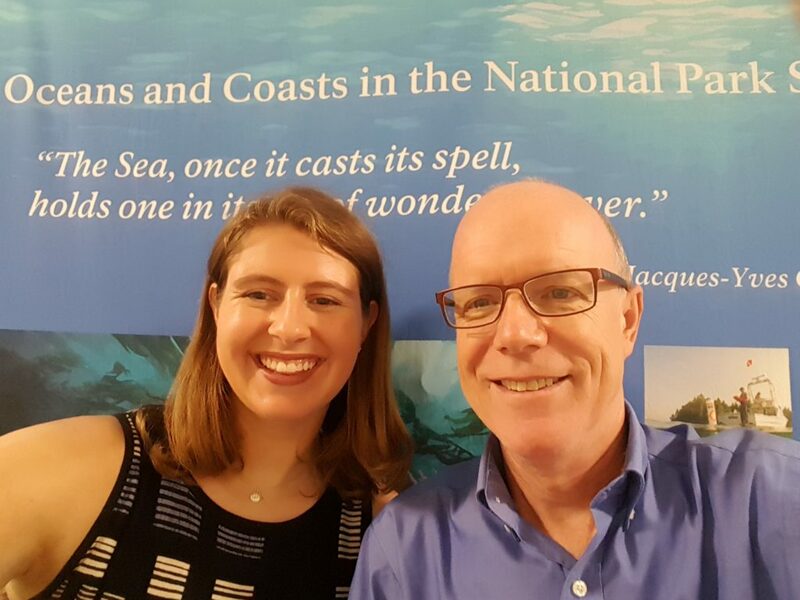 After arriving in Miami the previous day, in the early hours of Monday morning, Kathryn Grazioso, a marine ecology intern for the South Florida/Caribbean Network (SFCN), picked me up and drove me to the offices of the SFCN inventory and monitoring team. 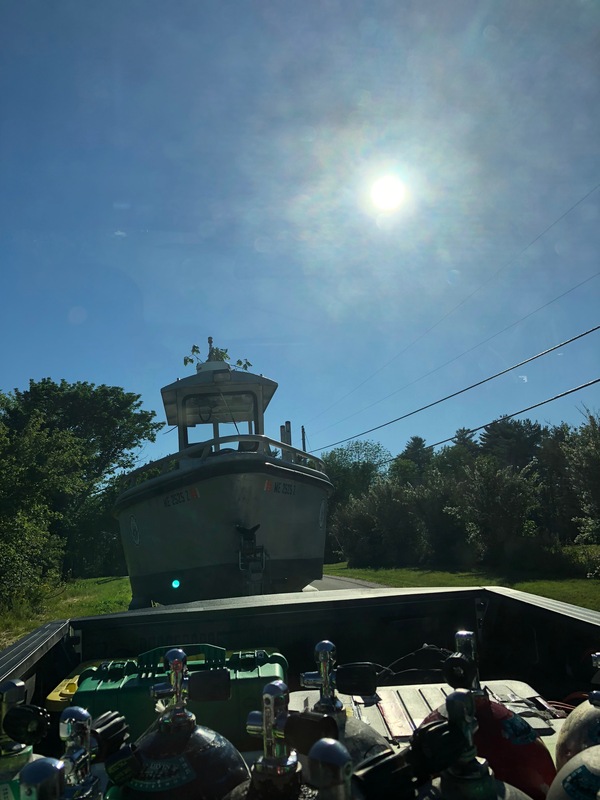 After loading the truck, Mike Feeley, a marine ecologist for SFCN, Kat, and I headed to Key West with the 29-foot boat in tow. To manage park resources and collection information about ecosystem health over time, the NPS created 32 inventory and monitoring networks. These networks collect and analyze data about the marine and terrestrial ecosystems of over 280 national parks. The data is then used to inform management decisions. 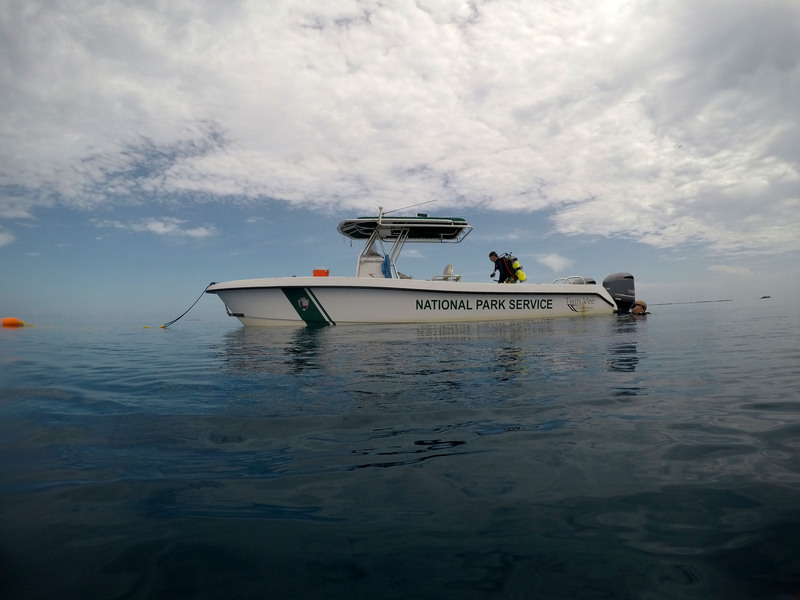 The South Florida/Caribbean Network I&M Program encompasses seven parks: Big Cypress National Preserve, Biscayne National Park, Everglades National Park, Virgin Islands National Park, Buck Island Reef National Monument, Salt River Bay National Historical Park and Ecological Preserve, and Dry Tortugas National Park (DRTO). For the next 10 days, I would be assisting SFCN’s marine team as they completed their annual benthic monitoring at DRTO. The MV Fort Jefferson would serve as our transportation to and from the park and our home base. 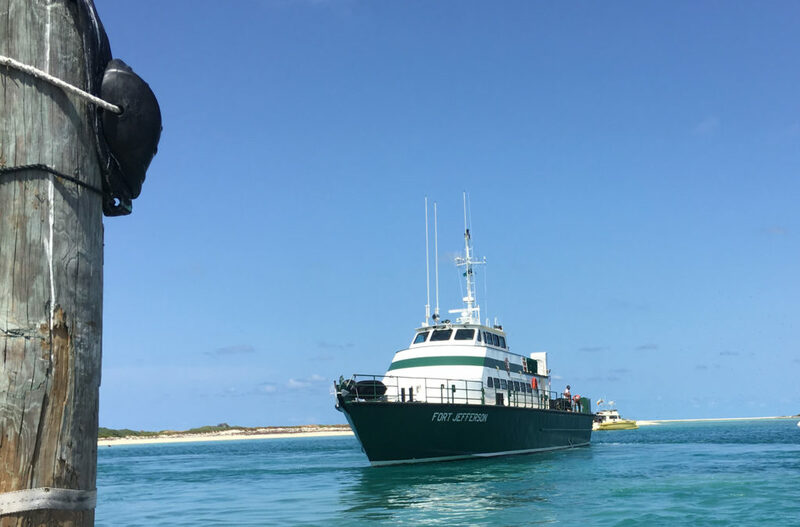 MV Fort Jefferson is a 110-foot, NPS boat used to transport staff and supplies to DRTO. Aboard the Fort Jeff are three crewmembers: Captain Tim, Brian LaVerne, and Mikey Kent, the Park Diving Officer at DRTO. After unloading our gear onto the MV Fort Jeff and receiving a tour of the quarters, we grabbed dinner in town and appreciated the final few hours of civilization. At 9 am, the following morning, the MV Fort Jeff left Key West and began its 5 hour trip to DRTO (located 70 miles west). 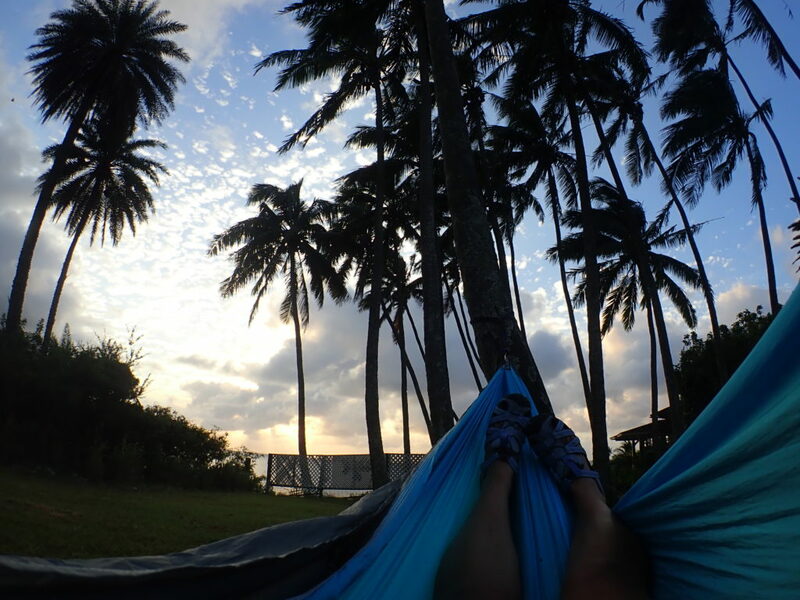 DRTO is a 100-square mile national park; however, with only seven small islands, a majority of the park is the ocean. Fort Jefferson, located on Garden Key, the second largest island in DRTO, was designated a National Monument in 1935. The monument was officially expanded and redesignated as Dry Tortugas National Park in 1992. There are only two ways to reach DRTO: boat or seaplane. While a ferry brings tourists to DRTO once a day, today the MV Fort Jefferson held not only the SFCN crew but a DRTO ranger, several DRTO interns, and a few visiting scientists. Upon arriving at Fort Jefferson, Captain Tim parked the vessel as everyone on board watched in awe. In the blazing heat, the SFCN group gave Kat, Tom Hyduk, another marine ecology intern, and I a quick tour of the Fort Jefferson. 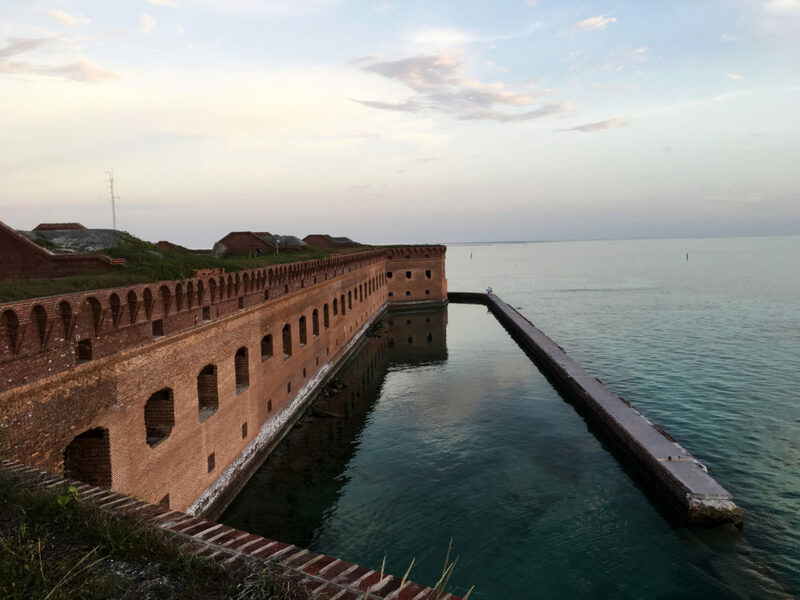 Construction of the Fort Jefferson began in 1847, and although never finished or fully armed, this impressive 19th-century fort was used as a military prison during the Civil War, a coaling station for warships, and a deterrent for passing enemy ships. Today, park staff work to protect the fort and return the impressive structure to its former glory. In every direction, the views were spectacular. Fort Jefferson’s clean lines complemented the calm waters. 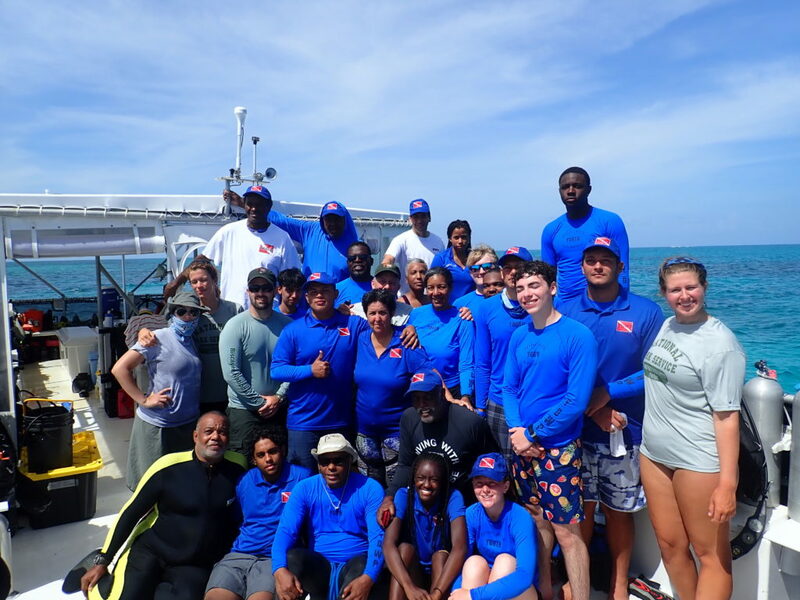 After our tour, we headed back to the MV Fort Jeff and began loading our boat with dive gear for our afternoon practice dive at Bird Key, located south of Fort Jefferson. At the site, before jumping in, Rob Waara, a marine biologist for SFCN, and Lee Richter, a marine biological technician for SFCN, set up a line/buoy for us to moor on. The purpose of this dive was to practice finding metal pins nailed into the substrate and learn how to set up the tapes for the transects. These pins marked both ends of a transect, and a predetermined compass heading was used to find the terminal pin from the start pin. Compass headings and distances also dictated the whereabouts of the subsequent transects. Photographs taken in previous years provided a little context when searching for the pin; however, the coral head or gorgonian located adjacent to the start pin in 2010 may not still be there in 2018. For most of the collection week, we were fortunate to have crystal calm water. On Wednesday, we headed back to Bird Key to begin our first day of collection. To mark the location of our first pin, we dropped a buoy attached to a dive weight at a known GPS coordinate. 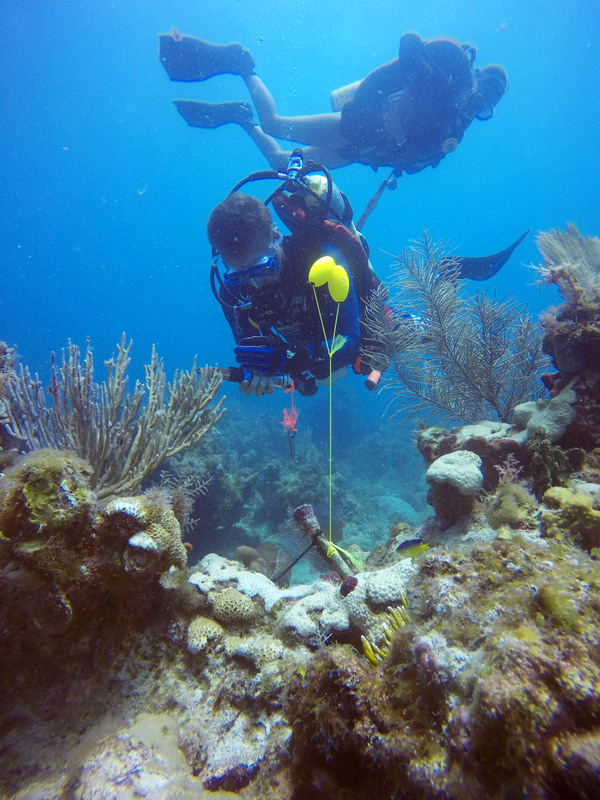 Affectionately known as “Kitty” because of the zip ties tied around the weight resembling whiskers, this buoy drop system allowed us to effectively travel from transect to transect at the surface between dives. On our first dive, Lee, Rob, and Mike set up the tape at the first transect. 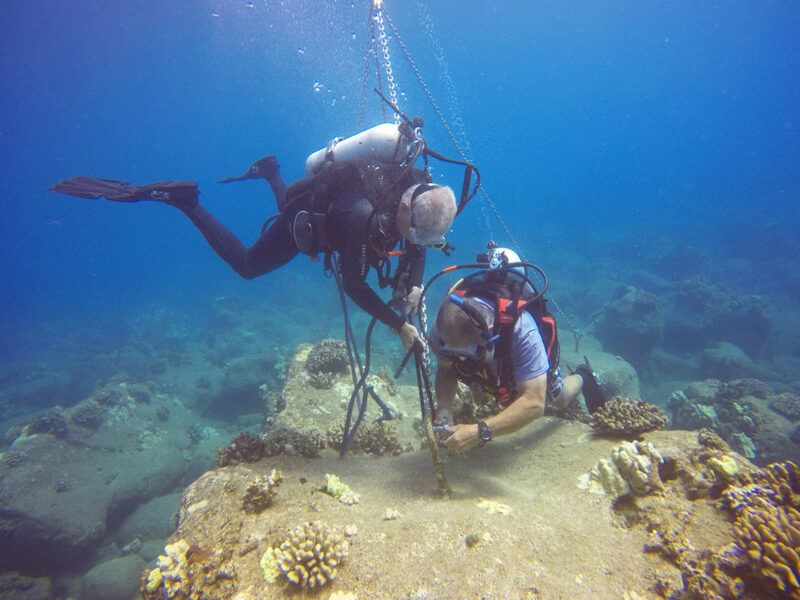 Rob then took video, while Mike and Lee swam down opposite sides of the transects collecting coral disease or coral species data. Upon demonstrating the data collection process, they signaled Kat, Tom, and I to continue ahead and begin looking for pins. During our two dives that day, Kat, Tom, and I successfully laid a few more transects while quickly discovering the with low visibility finding these metal pins was going to be harder than expected. 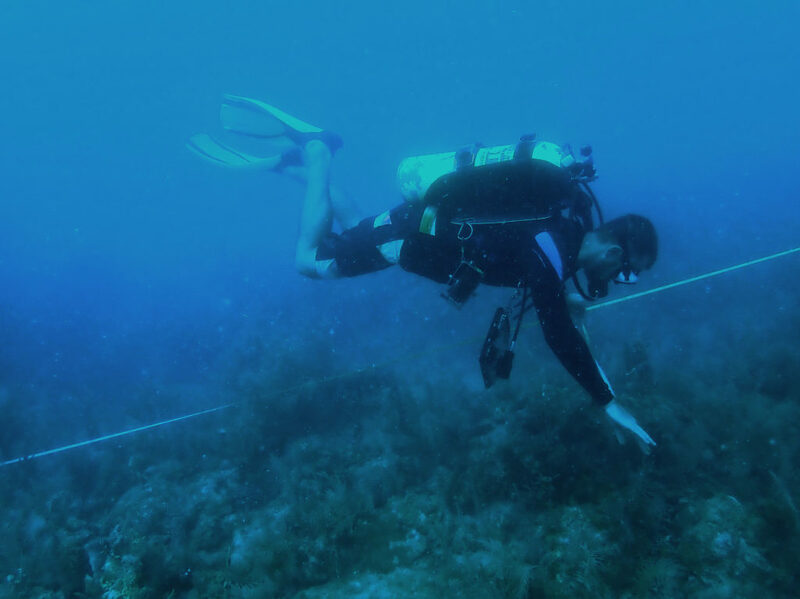 Lee travels along one side of the 10 m transect with a 1 m tape and counts the number of coral colonies. With two dives complete, we puttered back to the MV Fort Jeff with one engine. Unfortunately, during transport, one of the engine’s gas lines was damaged and began leaking gas. That night, we watched Captain Ron, a required viewing if you are visiting DRTO on the MV Fort Jeff. 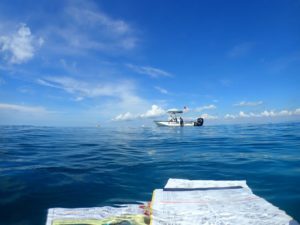 The next day, we returned to Bird Key and followed the same transect/benthic survey procedure. 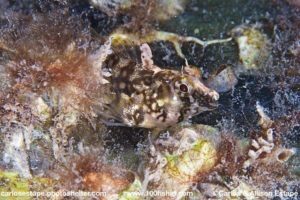 While we spent most of our dives heavily focused on the compass or tape in front of us, as we traversed around, it was hard not to notice the spectacular rugosity at Bird Key. In addition to setting up transects, Tom, Kat, and I were responsible for cleaning the pins (i.e. removing the encrusting organisms). To do so, Kat carried a massive, dull knife to smack the pins clean. 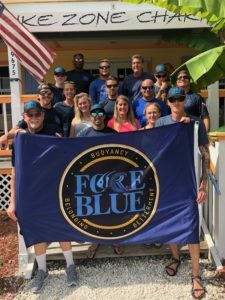 While this may sound silly, the knife was extremely effective and also produced a loud noise that often notified the remaining divers of our location. After collecting data from the remaining transects on Friday, we moved onto our next site Santa’s Village, located north of Fort Jefferson. Unlike the previous site, Santa’s Village had larger coral heads which dominated the ocean floor and left little space for seagrass and sand. In addition, pin-organization wise, this site was easier to navigate and required shorter swimming distances between transects, which was good because the site’s depth meant less bottom time. On Saturday, having left Bird Key and the mooring spot officially, we transition to live boating. For the next few days, as we finished up Santa’s Village and continued onto Loggerhead Forest, we would arrive at the site, drop Kitty, then Tom, Kat, and I would head down to set up transects. Sometimes, Rob would accompany us to film each transect. After returning to the boat, Lee and Mike, who had switched from open-circuit to closed-circuit, would descend to collect data. 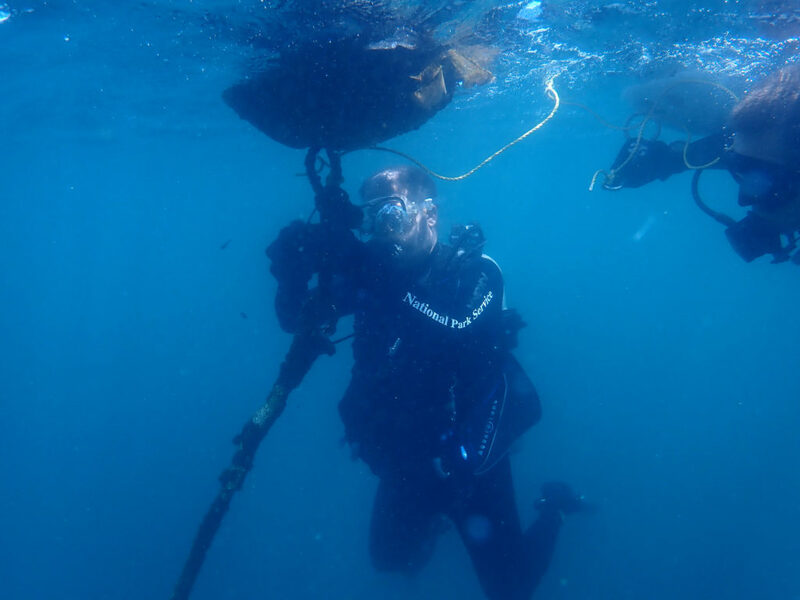 Their rebreathers allowed them to stay down for extended periods of time, which was especially useful since both Santa’s Village and Loggerhead Forest had a lot of disease. One afternoon, after a lovely day of diving, Mikey convinced Tom, Kat, and I to take his tiny sailboat out into the harbor. With limited to no sailboat experience, we all hesitantly agreed. Luckily, Kat had some sailing knowledge and was able to keep us from getting stranded. While we struggled slightly with the sails, we did not capsize, and we returned to shore on our own. So overall, I would consider that a success! As the days began to meld together, Tom, Kat, and I became very in tune with each other and could have entire conversations underwater solely through hand signals. On the final few transects, we also all practiced data collection. Colony count data would be used to determine disease abundance, whereas species lists helped to understand the diversity at each site. On our final survey dive, we were treated to visitors. Curious dolphins watched as we set up our first transect before disappearing into the abyss. With all benthic surveys complete, our final 1.5 days would be spent collecting HOBO data from the non-annual sites at DRTO. In total, SFCN has 14 sites around DRTO were benthic surveys are completed. 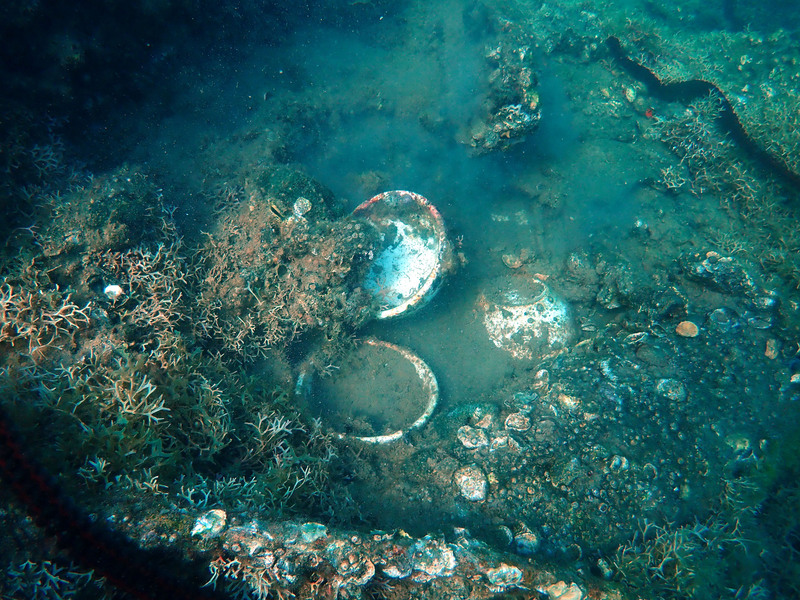 Only three sites are surveyed yearly, while the remaining 11 sites are patch reefs with less relief. Therefore, they are checked every few years on rotation. However, no matter the rotation, the HOBO data (i.e. temperature loggers) needed to be checked every year. To do so, 2-3 divers would descend after Kitty was dropped. Then the team would search for small floats tied to a pin. 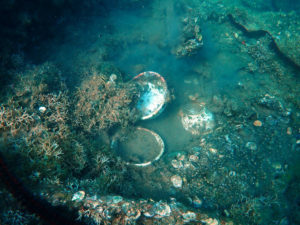 Upon finding the pin, the floats would be replaced and using a shuttle, the data from the two HOBOs at each site would be transferred underwater for future analysis at the surface. If the HOBO transfer failed, the device was taken to the surface for repair. On our final HOBO dive, Lee, Kat, and I saw a bull shark at our safety stop. Kat and I were just a little excited about seeing our first shark of the trip, especially since it felt like Rob, Lee, and Mike saw one every dive. After Kat replaced the yellow floats, Tom can be seen collecting the HOBO data with the shuttle. 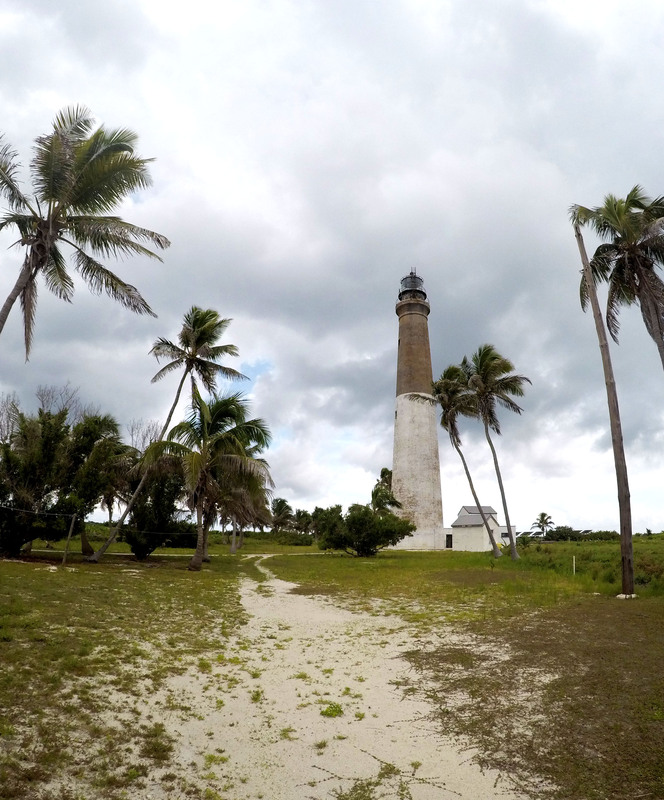 With HOBO collection complete, we stopped at Loggerhead Key, the largest island in DRTO. The island is home to a lighthouse and a few small houses. 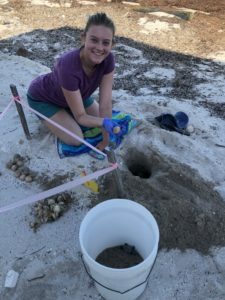 Currently, an intern lives on Loggerhead Key and performs turtle walks daily in search of new nests. Built in 1857, the Loggerhead lighthouse is not currently in use. As our time at DRTO winded down, we packed up our gear and prepared for the ride home. Our last day at DRTO was July 4th. And while no fireworks are allowed within the park, with a clear sky and amazing lightning storm over the fort, fireworks were definitely not missed as a mix of SFCN, and DRTO employees sat on the bow of the MV Fort Jeff. On Thursday morning, the boat left the dock and headed back to Key West. When we pulled into the harbor, the SFCN crew worked together to load the vehicles, trailer the boat, and begin the long drive back to Miami. After several bumps in the road, we made it back in the evening. I was fortunate enough to find a home that evening with Kat. 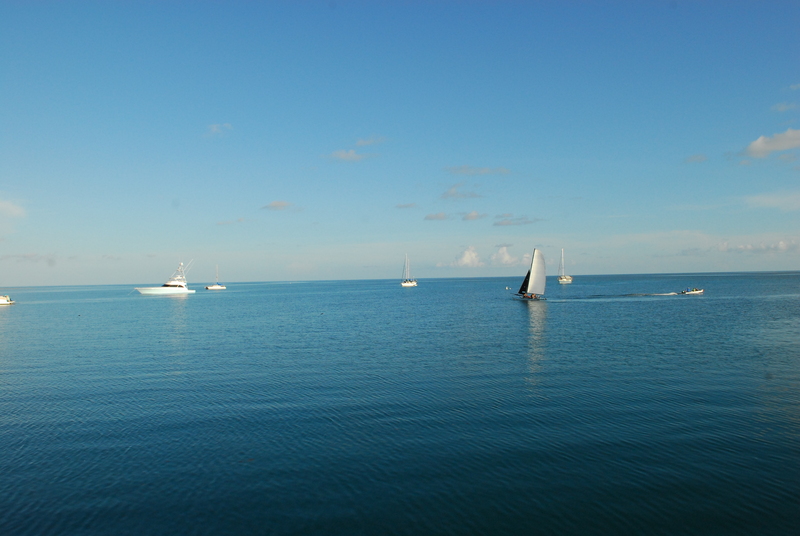 The next day, I would once again head to Biscayne National Park. This time, however, I would spend time with the Submerged Resources Center and Southeast Archeological Center as they participated in the Slave Wrecks Project. Thanks to the fantastic group at SFCN for welcoming me into the family for 10 days. We dove, we laughed, and we ate a lot of cheese balls! Also, thanks to the DRTO group and MV Fort Jeff crew for making my visit to DRTO spectacular! This entry was posted in 2018 National Park Service on September 5, 2018 by Shannon Brown. 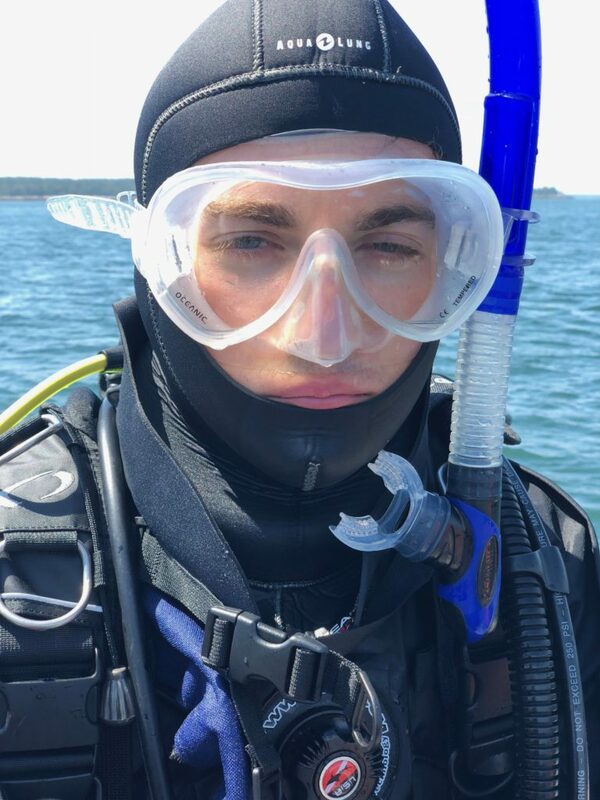 This week was a hectic week, I received my drysuit from USIA, I had AAUS class, a day dive with Doug and Thew, and had to prepare for the five-day trip DownEast. I was extremely excited to get my drysuit so thoughtfully given to me by USIA. 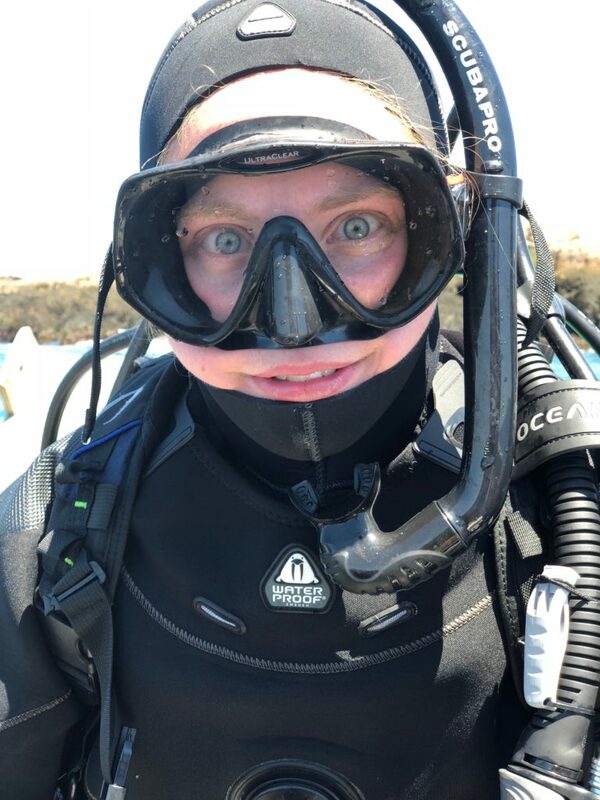 As much as I love diving four times a day in a wetsuit, I will be more comfortable in my drysuit and able to focus even more on the science at hand. 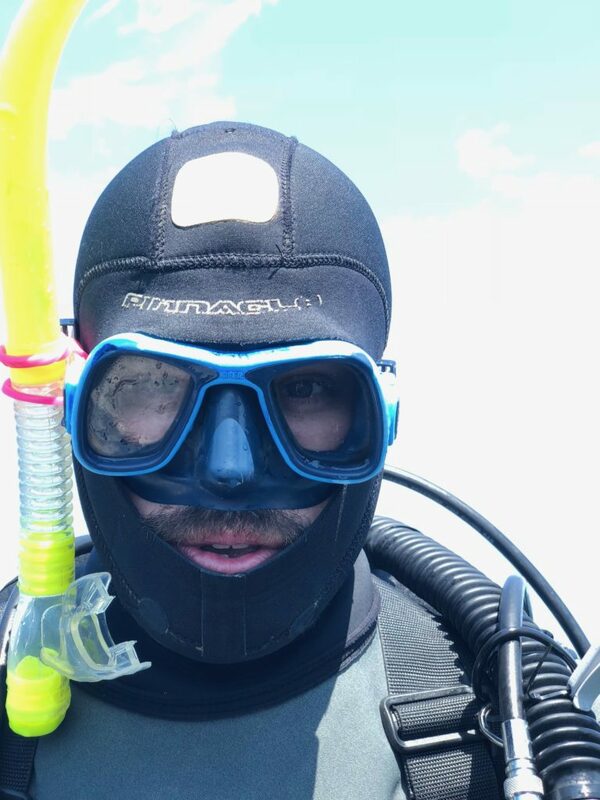 I am drysuit certified already but that was back in 2016. 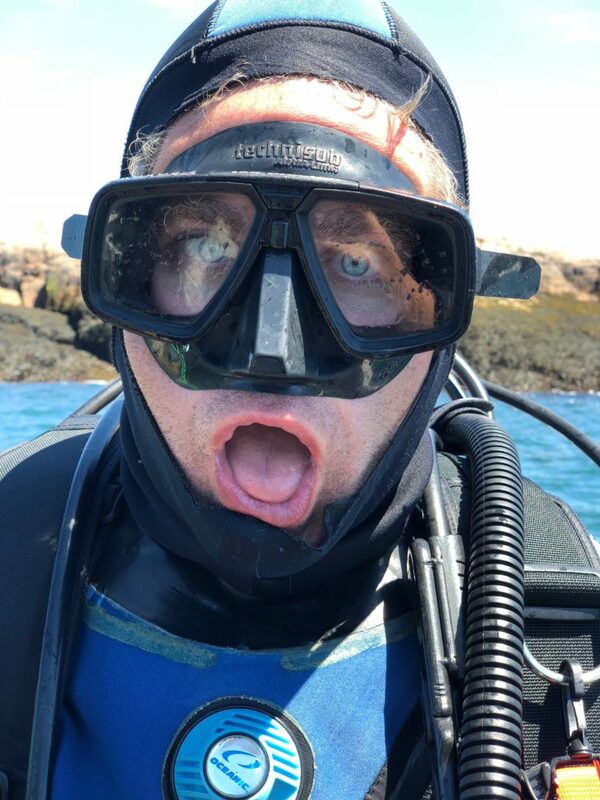 I metaphorically and literally was thrown into the deep end on our day trip out to Mohegan and Allen Island to test my drysuit for the first time. After a quick buoyancy check and 4 pounds of weight added to my setup, I was under the water and dry! 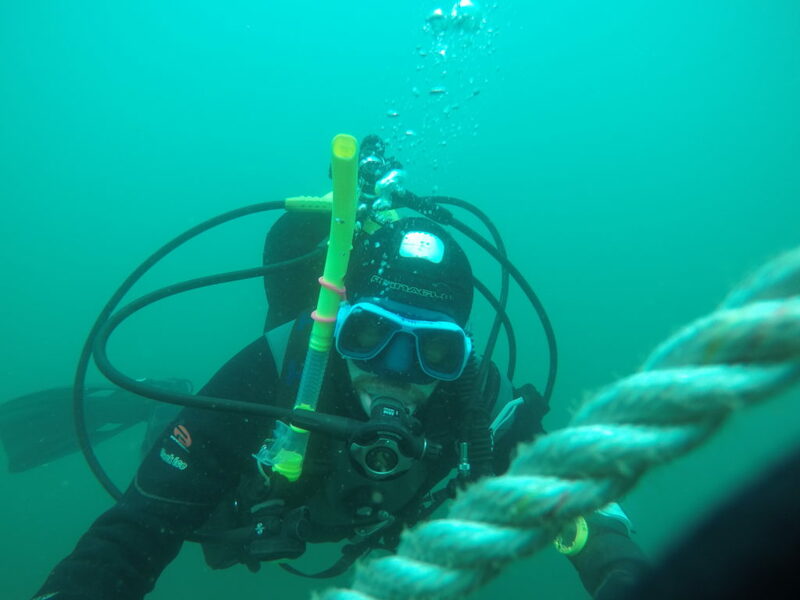 During my four dives of the day I hadn’t had too much trouble adjusting to my new dive setup; however, my position in the water seemed a bit more vertical than horizontal. My feet most of the time seemed to be above my head. 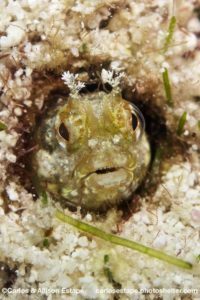 I’ll just brush that off and attribute it to me having to get down close to the substrate ripping out all the small little seaweeds which would lead to my awkward position. The dives themselves with nothing especially out of the ordinary. 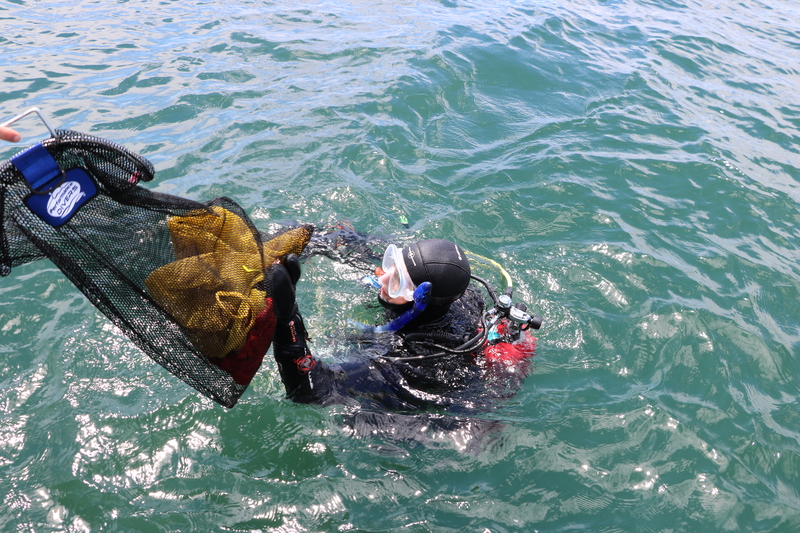 The collecting procedures are the same, but we have become more efficient as a team both under and above the water. One positive about going to these different islands and places along the Gulf of Maine is I get to experience Maine from the water. 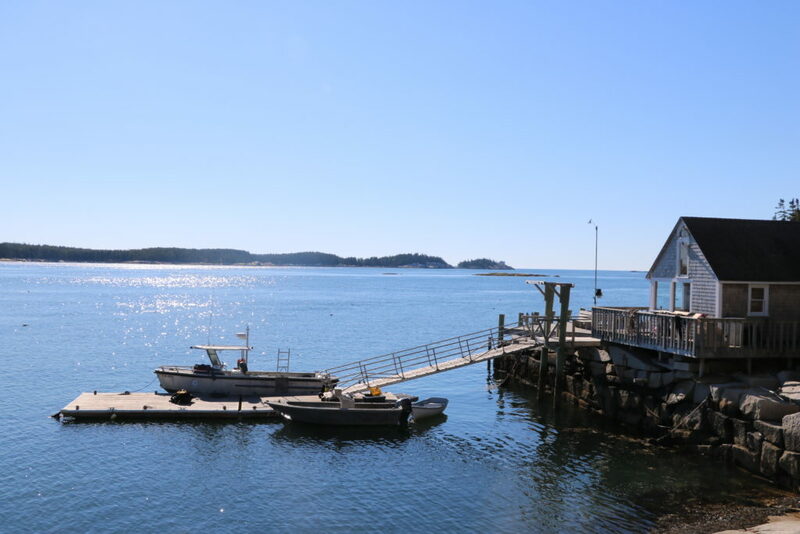 People, when they travel to Maine, might take a day trip out to an island and back, they get to experience a small fraction of the coastline and islands that Maine has to offer. Me on the other hand, taking day trips and overnight trips up and down the coast of Maine, I get to experience a wide array of beautiful scenery, with the best vantage point — the water. After the day trip to the different islands. I had all of Tuesday to process and digitize all the samples collected. 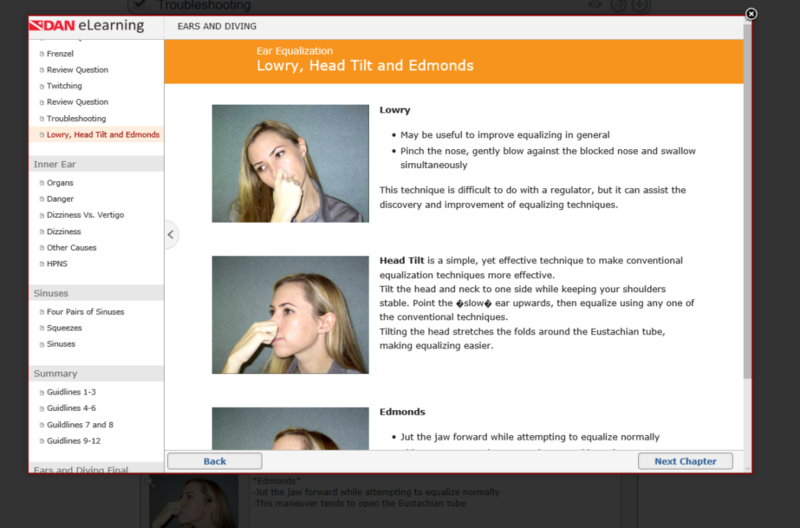 Wednesday was the 4th of July, yet there is no rest for the wicked, and we could not afford to miss an AAUS class. Chris gave the dive instructors the day off and with one student sick it was a very small class. Our task for the day was to relocate sand screws using compass bearings we took last week at the same dive site. These sand screws were placed in the middle of eelgrass beds. Once we located the screws we were to run a transect out and quantify percent eelgrass cover. There was a small competition between the students as to who could come up with the best sampling procedure. Chris would be the judge, and the winning procedure was the one we would use in the field. 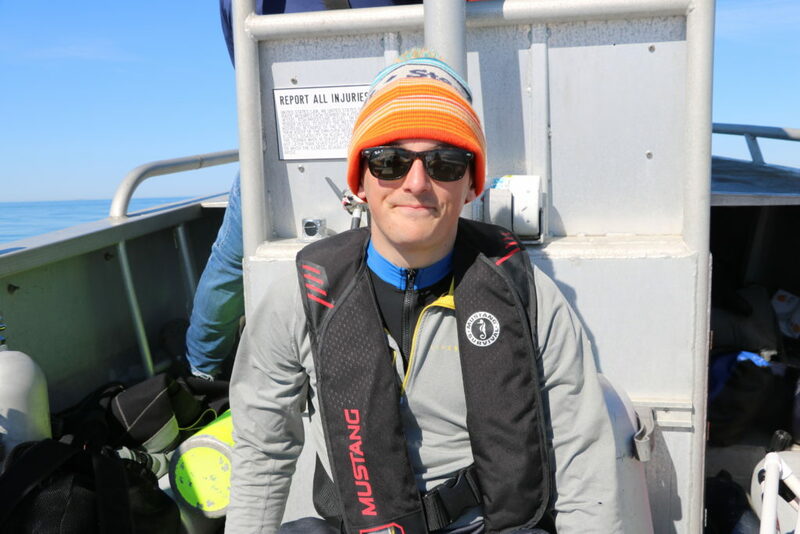 Nick won the competition and we would be using his protocol to conduct percent cover of the eelgrass along with height, substrate type, and lobster/crab counts. This exercise was to help the student dip their toes into underwater diving research. Chris gave Nick and me free rein to plan the dive, locate the screws, and conduct the survey while just watching above. 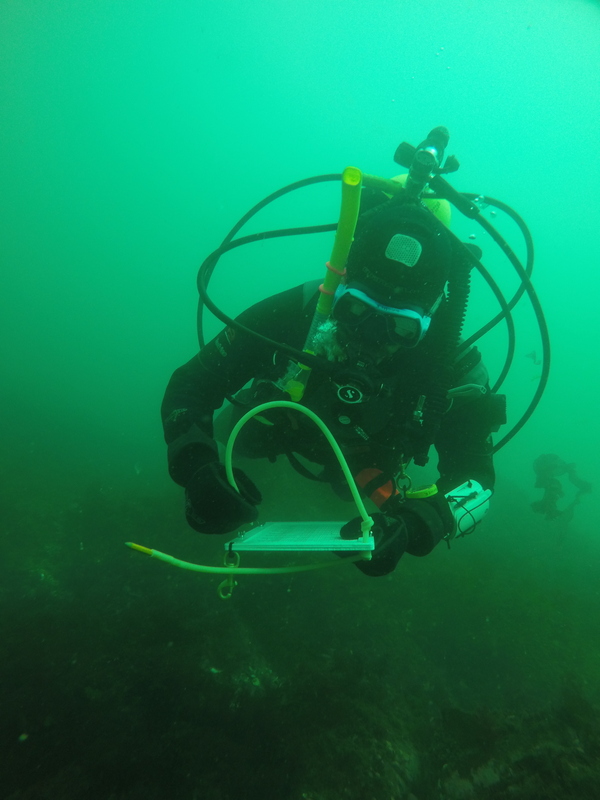 We were using similar material like when I dive with Doug and Thew, transects, quadrats, and writing slate. Thus, for me, I felt this was good practice to try and focus on my buoyancy skills while conducting the survey. In reality, the data we were collecting was just an exercise. I think there were more important aspects of scientific diving that Chris wanted us to see and try and work through. One of these skills was underwater communication. 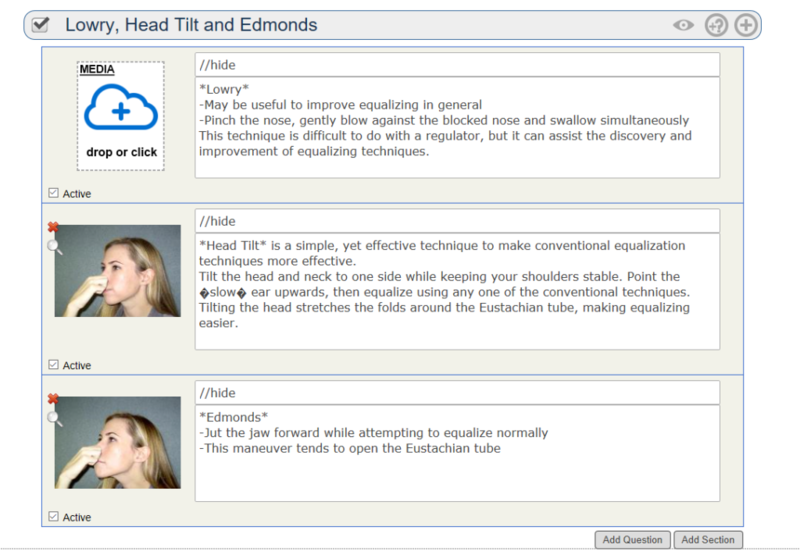 I found it key when diving with Doug and Thew to have good underwater communication. In our work together, we often place each other’s quadrats at the meter tape or ask if one person can move on to the next meter mark, or just asking if they are okay. Being aware of what your partner is doing under the water is a principal component of scientific diving. Another foundation principle is buoyancy especially with a sandy or silty substrate. In those conditions, one needs to pay attention to hanging gauges and equipment and especially their fin kicks. Even a hand touching the muck can disturb and add a plume of dirt into the water and into your quadrat. 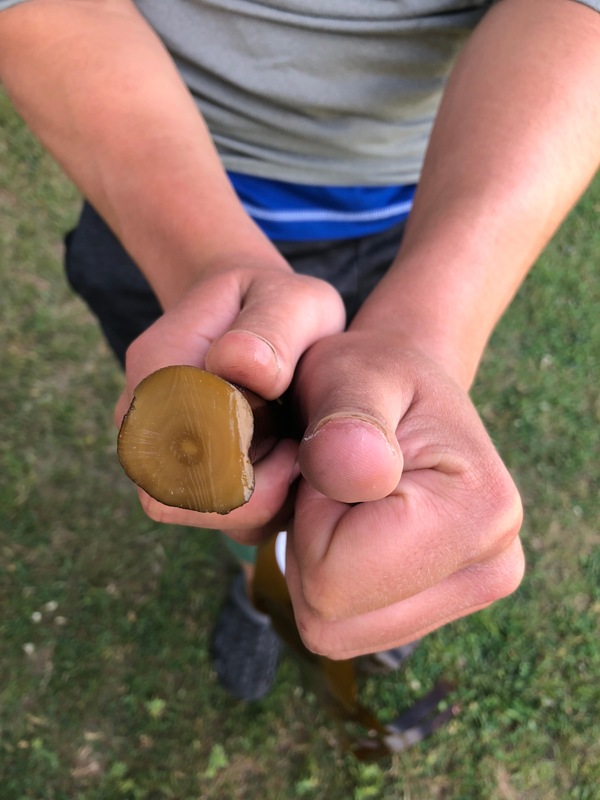 We worked through these skills and surveyed two sand screws in two eelgrass beds. Another successful day of class. The following Thursday and Friday was purely prepping for our DownEast trip. As a Midwesterner and especially as someone from Minnesota the term “DownEast” was extremely confusing for me. To Mainers, DownEast means north, up the coast. I understand the east part because Maines coastline juts out to the east but I still don’t understand the down part. I call everything up, “up north” “I’ll come up to visit you,” even if someone was south we would still call it up, but I digress. enough collection/sampling equipment along with all our processing equipment. During these five days and four nights, we were living out of a motel, not an ideal place to sort and process samples. However, we brought our whole lab sorting equipment with multiple plastic bins and sorting trays of various sizes. Lastly, we needed to bring extras of most things. 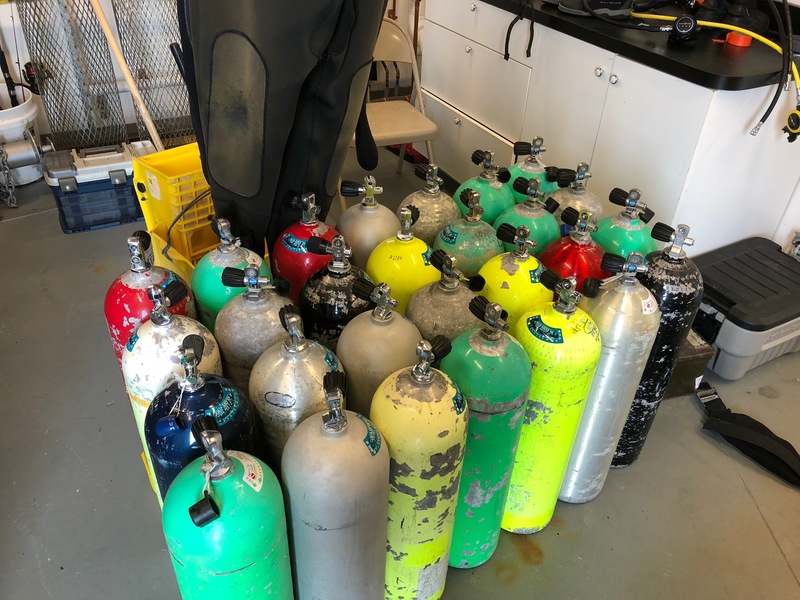 Besides our BCDs and exposure suits we had extra of almost everything, writing slates, quadrats, meter tapes, collection bags, multiple save a dive kits, coolers for kelp storage. It was quite the process of getting everything organized and then trying to fit it in the back of a truck. Doing some tree trimming with the RV Silver Sides. The trip was from Saturday to Wednesday and we would have some help diving. 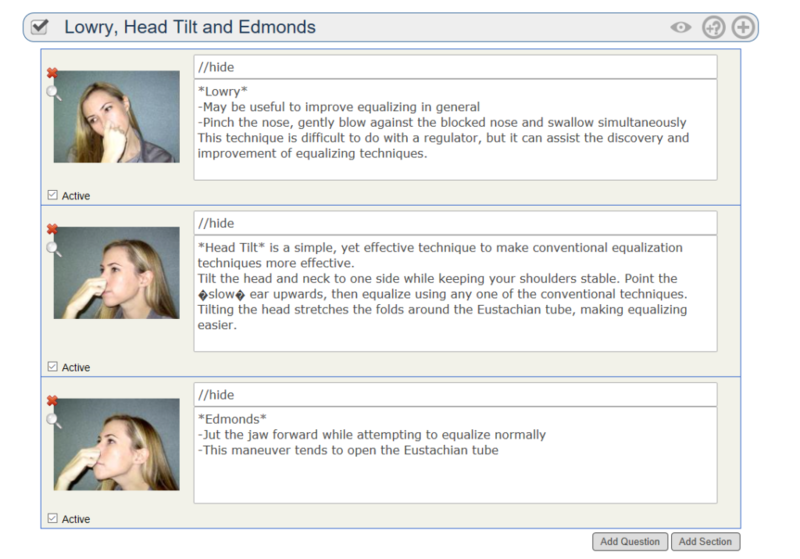 Liz Maxwell a fellow scientific diver from U. Maine who previously dived with Thew would be joining us for one day. 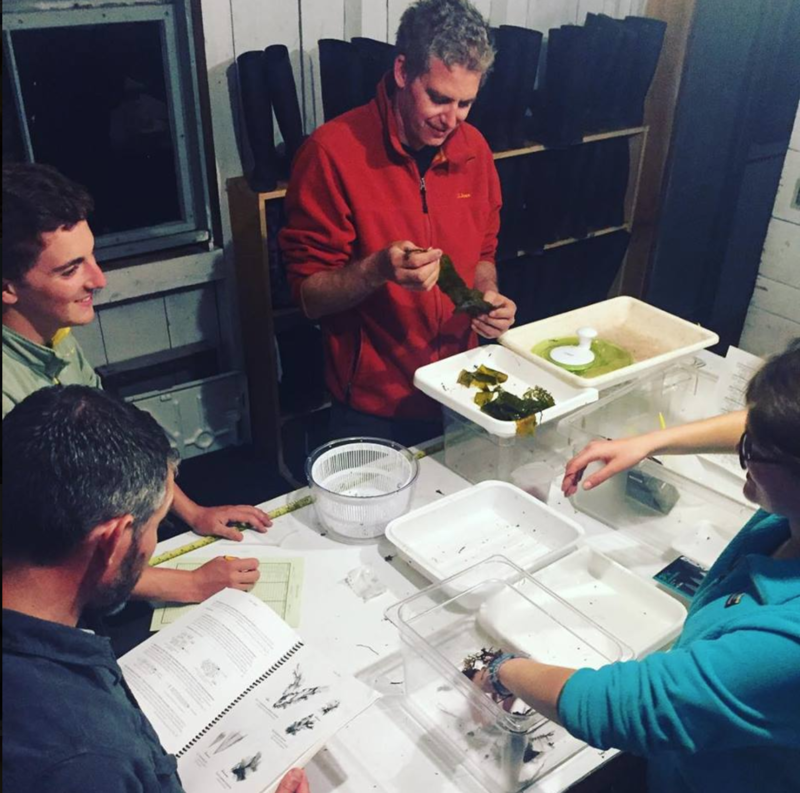 We also had Courtney there to help with general organization and seaweed processing. She was also the main DJ for the trip, as we remembered a portable Bluetooth speak which as Doug put it “Increased the coolness of his lab.”Our days were long, but fruitful, with fun mixed in too. Morning wakeup calls would be at 5:45 to promptly go to breakfast by 6 a.m. We would be out on the water all day with long boat rides to far east sites. We won’t be back to the samples at the motel unit 5pm most nights. Our work did not end there; we would usually go right from diving to sorting for three hours or so before cleaning up and going to dinner at Helen’s. Something that was on everyone’s mind at the end of a long workday Along the Bold Coast, where we would be sampling the water was cold. The surface water was a balmy 50 degrees and temperatures at depth were as low as 47 degrees. My drysuit came in handy keeping my dry and happy all day every day. Like I said early, in my drysuit, I am happy and comfortable at the end of a four-dive day. The first day of diving because of Liz I only had to dive twice instead of four times. This was a pleasant break from under the water and gave me a glimpse of what Doug and Thew do above the water. While diving the surface people are transferring the seaweeds from collection bags to storage bags, organizing the boat, and just enjoy the sunshine. With my time not diving on the first two dives, I got to take some great but maybe less the flattering images. Diving isn’t always easy. Getting into a BCD can be difficult as Thew demostrates. These dives would follow the same procedures as the previous ones with our efficiency going through the roof. I’ve started while collecting the understory to try and identify each species before putting it in my collection bag. Ironically, identifying the small red seaweeds can be easier in the water than online. On the surface the frilling reds clump together making their distinguishable markings hidden; however, in the water, the frills of the seaweed are flowing making them somewhat easier to identify. 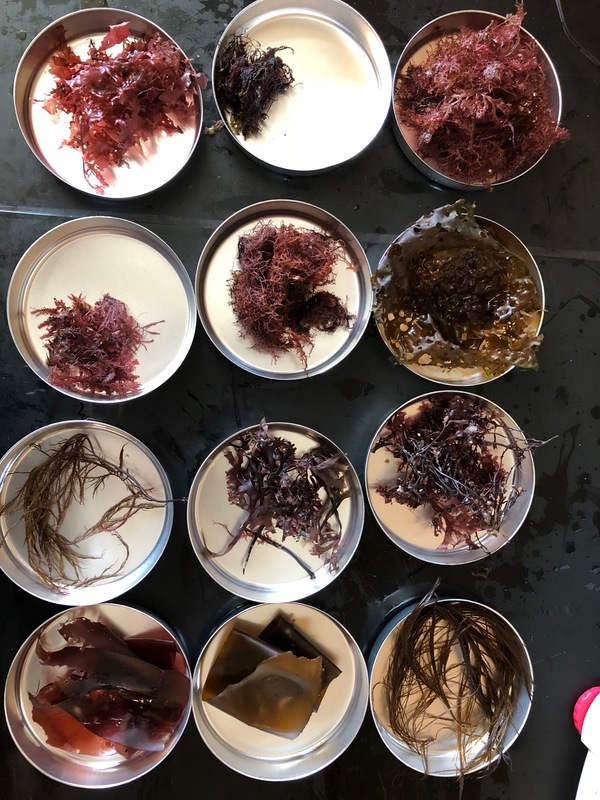 12 different seaweeds separated to be placed in an oven to dry them out for a comparison between wet and dry weights. During the days of diving, we had a diverse array of sites, some silted out with little kelp and seaweed, and others with an abundance of large kelps. Kelp can be as small as this juvenile. One site, in particular, exemplified a mass aggregation of primary productivity. 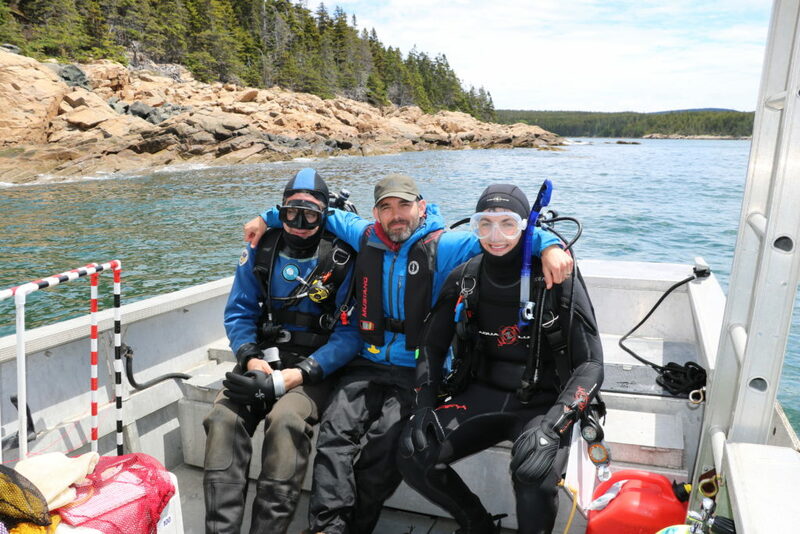 It was our last dive DownEast, and we were diving at the site named Ram Island. In past surveys, the kelp has not disappointed and that was sure the case this time. Doug and I after the dive both proclaimed that this was hands down the best of the summer so far. Our opinions were backed up by my collection bags which were overflowing with kelp. There was so much kelp per square meter that some of our collection bags were too small to put all the kelp and understory in them. The dominated kelp was L. digitata. 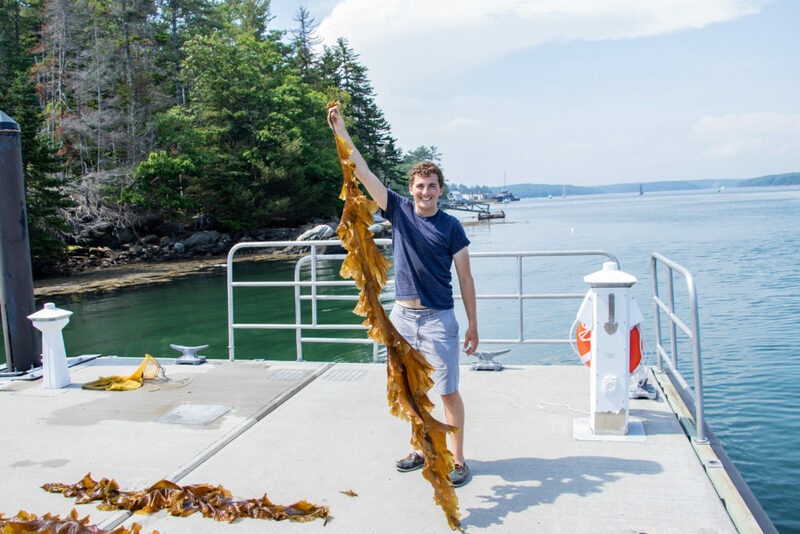 These kelps can get big, four feet or so, but the length of the kelp is not the impressive part of this species. Instead, the stipes of these kelp are most impressive. The stipes are significantly larger than one’s thumb and have multiple three to four-foot-thick blades originating from the bottom. One plant can weigh a couple kilograms if it’s big enough. In one square meter, there was over 13 kilograms’ worth of kelp, not including the understory which covered the floor! It is amazing to see such primary productivity in such high abundance, a true sight to behold. It was a great farewell to DownEast and from there it was back to Bigelow to continue processing the kelp. Kelp covers the sea floor. Doug writing on his slate. 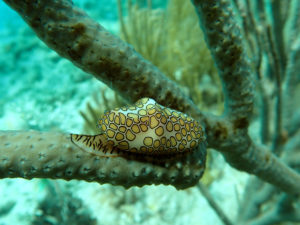 Next week will be less diving and more data entry from our recent trip. 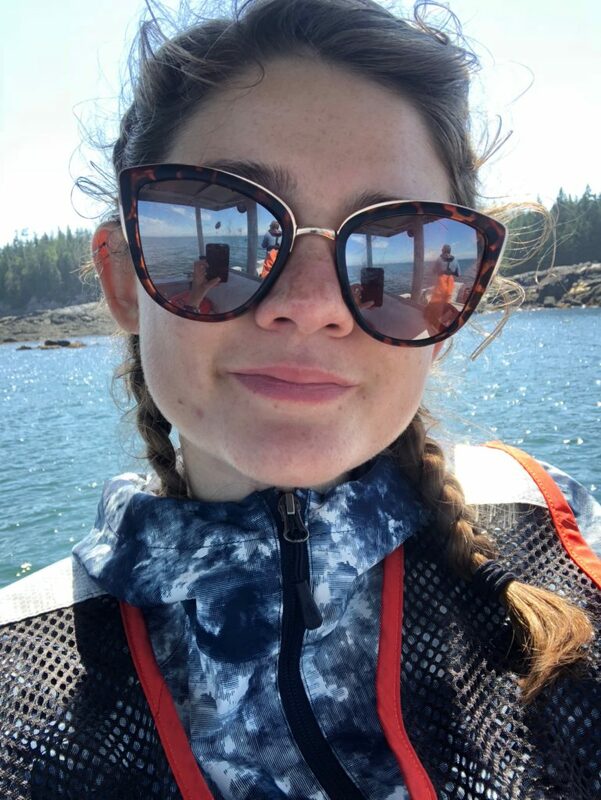 AAUS class as usual and our class has scheduled a boat charter to dive on Monhegan Island which will be a great experience in a less formal scientific training setting. Rumor has it we will be doing some deep diving. Thank you, USIA for the gift of dryness, to the DMR for lending us the tanks, and as always OWUSS and AAUS for this underwater adventure. This entry was posted in 2018 Somers AAUS on August 8, 2018 by Shane Farrell. 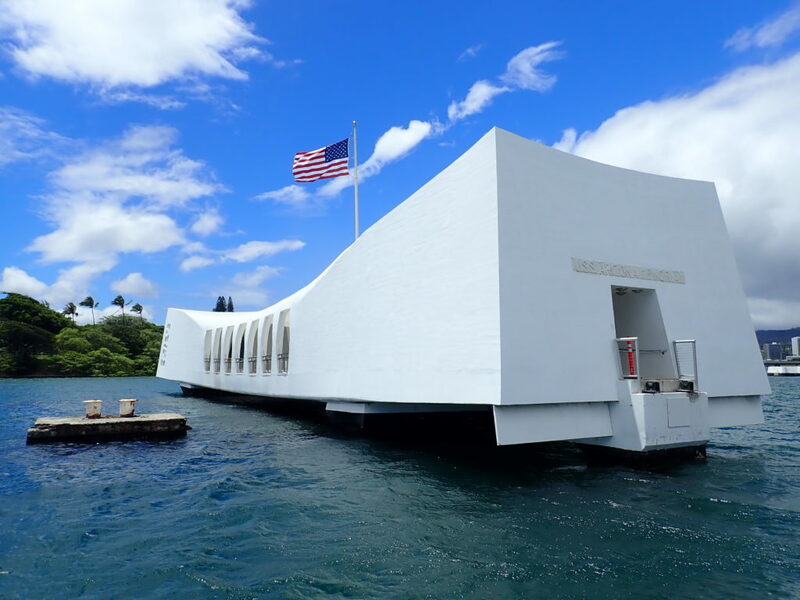 In 1962, the USS Arizona Memorial was constructed over the sunken vessel to commemorate the lives lost in the Pearl Harbor attack and allow visitation of the site. The National Park Service took over operations in 1980 and worked jointly with the US Navy to open the USS Arizona Memorial Visitor Center. An executive order in 2008 established the World War II Valor in the Pacific National Monument (VALR) which placed the USS Arizona Memorial, USS Utah Memorial, USS Oklahoma Memorial, and several other WWII sites under the care of the NPS. I arrived at VALR on Wednesday morning and was blown away by the crowd and the visitor center, which was updated in 2010. When I was about seven years old, my entire family traveled to Hawaii on vacation. Other than losing my mask to the waves, the only memory I have of the trip was my visit to Pearl Harbor. I was excited to return and to work alongside the NPS. Upon heading to the rangers office, I was greeted by Scott Pawlowski, Curator and Park Dive Officer at VALR. Scott explained our plans for the next few days, detailed the diving program at the park, and gave me a quick tour of Ford Island. For the remainder of the afternoon, Scott gave me the chance to explore the visitor center. 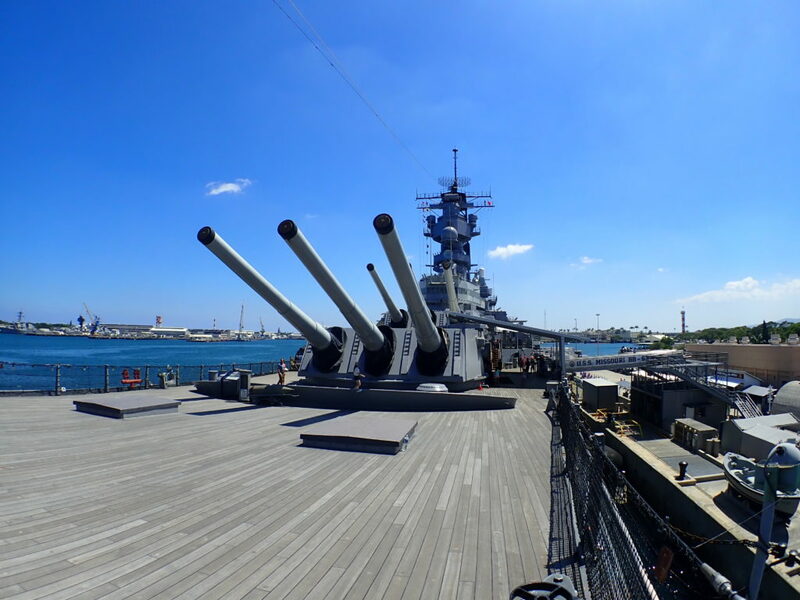 Since the expansion, the center allows visitors to visit the three memorials while also having access to the USS Bowfin Submarine Museum, the Battleship Missouri Memorial, and the Pacific Aviation Museum. 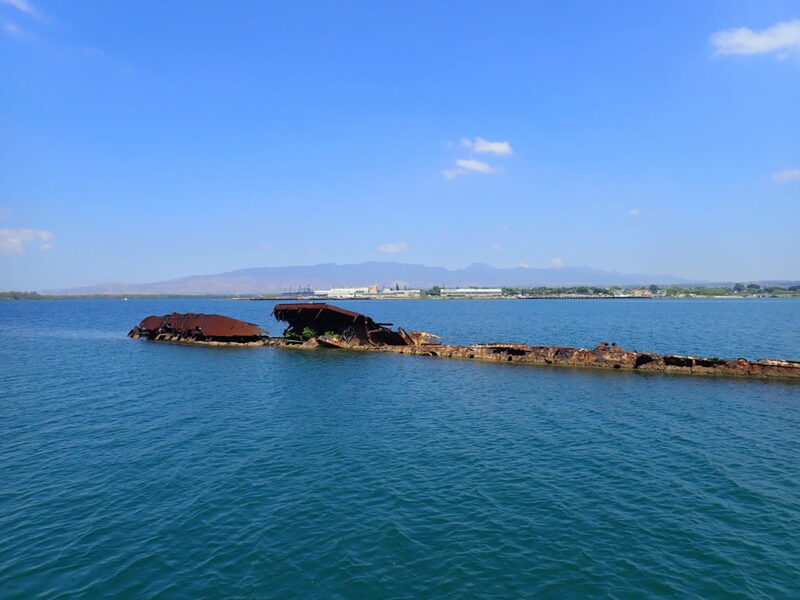 On Dec 7th, the USS Utah was hit by two torpedoes which caused the vessel to flood and sink. After several failed attempts to raise the ship, the decision was made to leave the vessel in Pearl Harbor. During my visit, the USS Arizona memorial was closed due to an engineering issue with the floating dock connected to the Memorial. However, I watched the short documentary and took a boat tour over to the ship. On Dec 7, 1941, about 15 minutes into the attack on Pearl Harbor, the USS Arizona was bombed by the Japanese. The bomb detonated in the powder magazine and caused the violent explosion of the ship which killed 1,177 servicemen. While 21 vessels lay sunk or damaged after the attack, almost half of the casualties on that day are attributed to the USS Arizona. My next stop that afternoon was the USS Missouri. Located across from the visitor center and accessible by bus, this American battleship was commissioned in 1944. Most significantly, on September 2, 1945, the deck of the USS Missouri was the site in which the Allied and Axis powers signed an agreement of peace. After being decommissioned after the Korean War, and then recommissioned to provide support in Operation Desert Storm, the USS Missouri was decommissioned her final time in 1992. Upon completing her active naval service, in 1999, the USS Missouri was placed as a centerpiece in Pearl Harbor to help symbolize the formal ending of World War II. My final two stops of the day were the Pacific Aviation Museum and the USS Bowfin Submarine Museum. The USS Bowfin was launched exactly a year after the attack on Pearl Harbor. 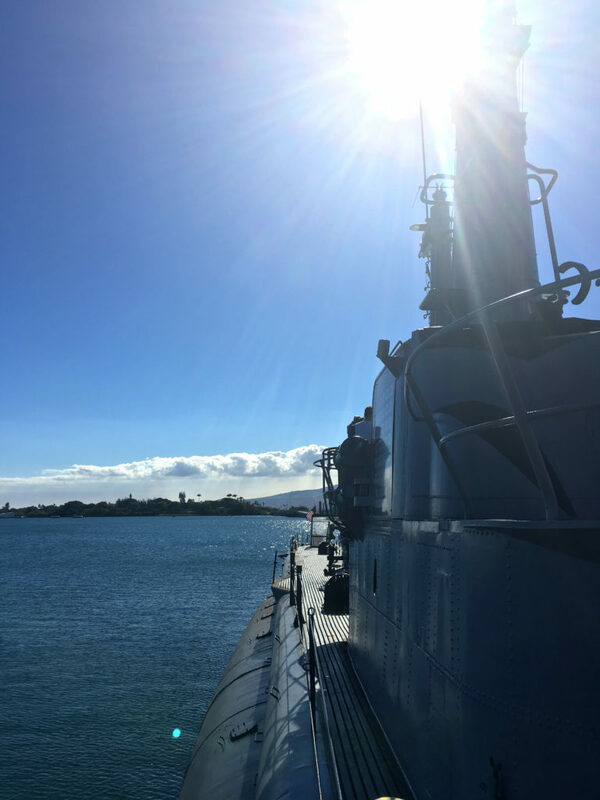 This fleet attack submarine now resides by the Pearl Harbor Visitor Center and allows guests to explore her narrow hallways while learning about her nine war patrols between 1943 and 1945. With no diving scheduled until Friday, I spent the next day on base working alongside Scott and Stan Melman, current archivist at VALR. My first project was to unlock several CDs which contained eyewitness accounts of the attack. Once unlocked, these CDs would be shared with the public and used to add to the historical record. Unfortunately, even after much research, I was unable to unlock the CDs. While I felt defeated, I still eliminated a few potentials and hopefully made success more likely for the next individual. My second project of the day was to research waterproof and oleophobic fabrics or coatings that could be used for an upcoming project. The USS Arizona went down with about 500,000 gallons of oil and is still leaking about 9 quarts a day. To prevent oil from contaminating the surrounding ecosystem, later this year, Scott and Brett, Deputy Chief and A/V Specialist at the SRC, hope to create a collection tents that they can capture the leaking oil. 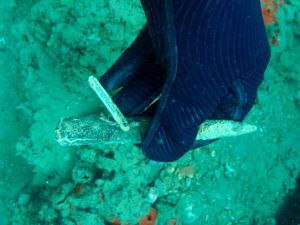 Previous attempts have failed because the materials were compromised by the underwater environment and exposure to oil. While spending the day in the office, I was also given the amazing opportunity to join several military personnel on a tour of the historical collected led by Scott. The historical collection at VALR includes over 60,000 objects ranging from photographs, drawings, memorabilia, diaries, newsletters, etc. that pertain to the War in the Pacific. The collection is used by the park for public programs; in addition, the park works to preserve and protect these resources while making the archives available to researchers. Each item in the collection tells its own unique story. On Friday, I arrived at VALR with my scuba bag in tow. 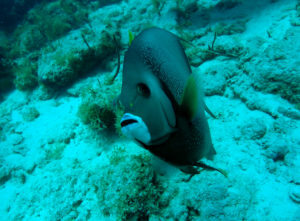 Currently, VALR has a small dive team which dives 30 to 120 times per year depending on the needs of the park. The purpose of today’s dives was to replace the buoys on the USS Arizona and USS Utah. Buoys placed at the bow and stern of each vessel are changed every 6-7 weeks. 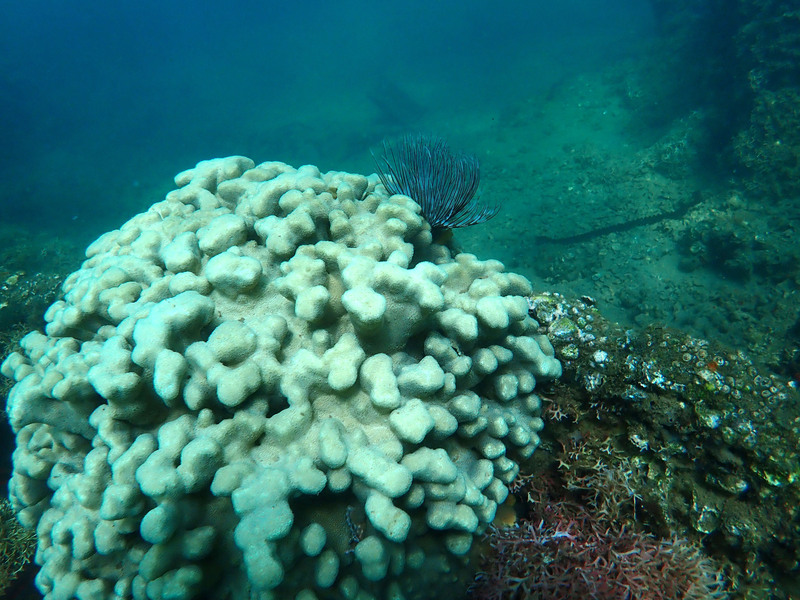 Even with only a few weeks in the water, the once clean, white buoys are quickly covered in encrusting organisms. To eliminate the hours wasted cleaning organisms and oil from the underside of the buoys, Scott devised a plan to wrap the buoys in saran wrap. After preparing four buoys, Scott, Stan, and I met up with Dan Brown, Concessions Management Specialist at VALR and our third diver. When the memorial is open, usually the VALR dive team relies on an O2 kit and dive flag located at the front of the memorial. With the memorial closed, we took a few additional minutes to load our small boat at the visitor center. After notifying the NPS and US Navy by radio of our dive operations and boating plans, we slowly migrated to the USS Arizona and began setting up our gear. With a giant stride from the dock, Scott, Dan, and I were in the water with the new buoys in tow. As we swam towards the stern against the surface current, I watched as Scott quickly clipped on the new buoy before removing the previous one. After repeating the same procedure at the bow, Scott, Dan, and I ducked under the surface to complete an orientation dive. Diving the USS Arizona was a surreal experience. 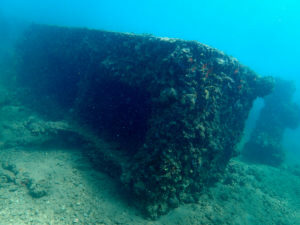 Today, this vessel remains the grave for over 900 servicemen who died on December 7, 1941. And while over 1.5 million people visit the memorial each year, I was among the few to have the privilege of diving such an important landmark of American history. As the silence of the underwater world set in, I thought of the many men who lost their lives that day and the efforts of the NPS and US Navy to protect the USS Arizona. As we explored the USS Arizona, Scott pointed out a well-preserved section of tile from the kitchen and a patch of wooden decking peaking out from under the sediment. With limited experience on wrecks, I was surprised with how well many of the artifacts on the USS Arizona were preserved. From kitchen bowls to pots to shoe soles, every piece of history made the vessel feel as though a lively crew had just inhabited its hallways. In contrast to the death the vessel represents, life in the form of marine creatures can be found at every surface. Beautiful feather duster worms extend their radioles into the water column while sea cucumbers twist themselves around the diverse sponge species that cover the now abandoned deck. The USS Arizona is around 30 ft at the deepest point. After surfacing, Scott commented on the spectacular visibility. 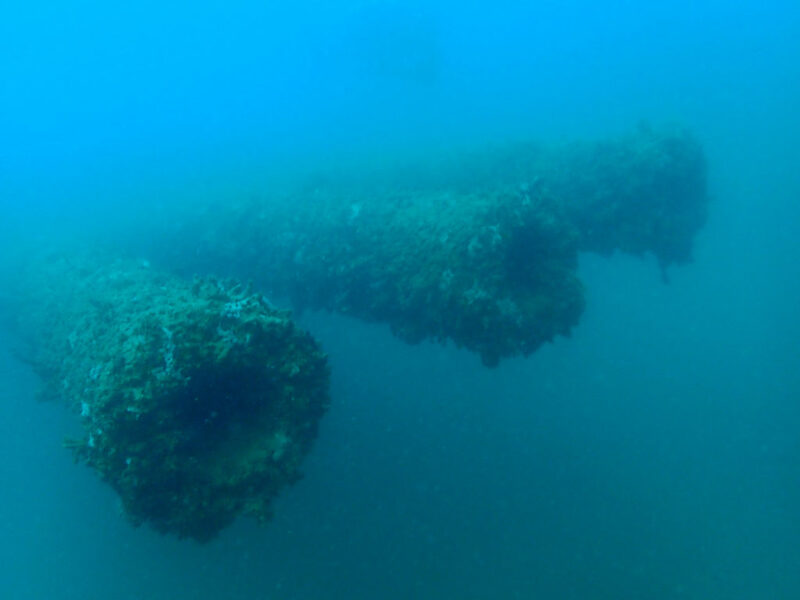 Unbeknownst to me, 15-20 ft visibility on the USS Arizona was rare due to its location in the harbor. So not only was I fortunate to dive the site, but I was also lucky that my dive buddy was in view. While we, unfortunately, ran out of time to dive the USS Utah, I will never forget the afternoon that I spent diving the USS Arizona. 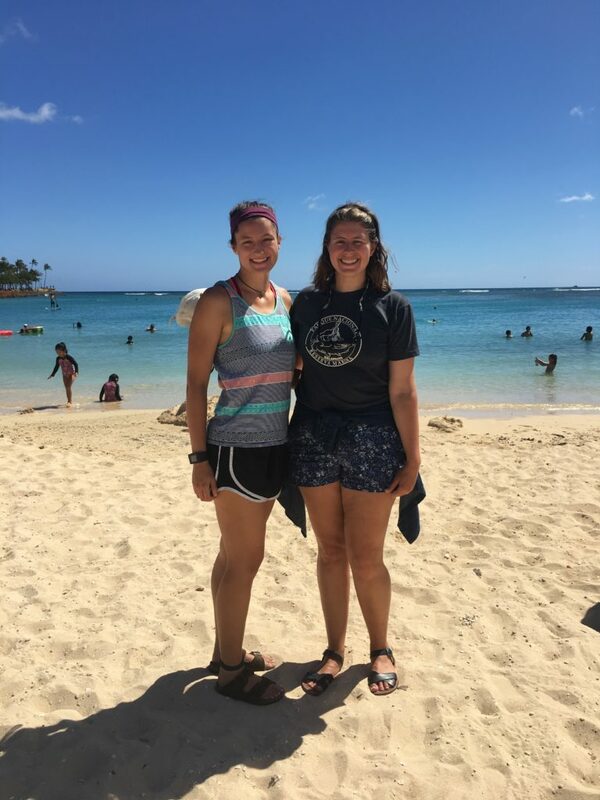 Before leaving Hawaii for the mainland to continue my adventures, I was fortunate enough to catch up with Erika Sawicki, the 2017 OWUSS AAUS intern. 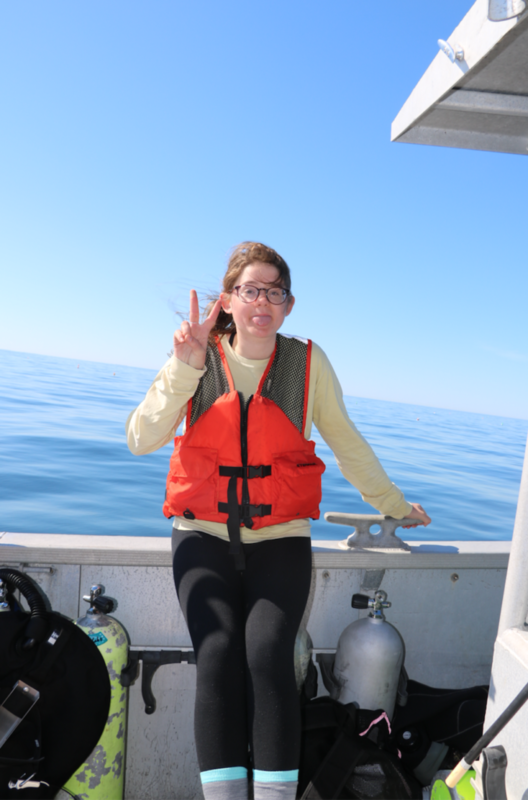 Last year, she spent time at Scripps Oceanographic Institute and worked alongside NOAA at Gray’s Reef National Marine Sanctuary. If you are interested in learning about her internship, click here. Thanks for all those who welcomed me to World War II Valor in the Pacific Monument. Even though my visit was short, I am so thankful that this internship gave me the opportunity to return to Pearl Harbor and observe all the amazing work the NPS does at VALR. Next stop, Dry Tortugas National Park with the South Florida/Caribbean Network Inventory and Monitoring Program! During the busy season, certain areas of the USS Arizona are riddled with debris as tourists lean over the memorial railing and drop their glasses, wallets, etc. This entry was posted in 2018 National Park Service on August 6, 2018 by Shannon Brown. On Sunday, after arriving in Honolulu the previous night, I caught an 8-passenger plane to Kalaupapa National Historical Park (KALA). I was picked up at the airport by Eric Brown, the Park Dive Officer and a marine ecologist at KALA, and his wife, Claire, who have lived on the peninsula for 13 years. After a quick tour of the settlement, Eric dropped me off at Bay View Home, my home for the next week. Built in 1916, Bay View Home originally served as a group home for older, disabled, and blind patients. With my duffel, dive bag, and groceries in hand, I climbed aboard to begin my next adventure! With no known cure in 1866, as Hansen’s Disease began to spread across Hawaii, the current monarch (King Kamehameha V) decided to exile thousands to the isolated peninsula. Families were broken as children and spouses were ripped away from their homes and relatives. Patients of this isolated colony were treated as prisoners with limited access to resources and reduced contact with the outside world. Over 8,000 people lived and died on this remote peninsula. 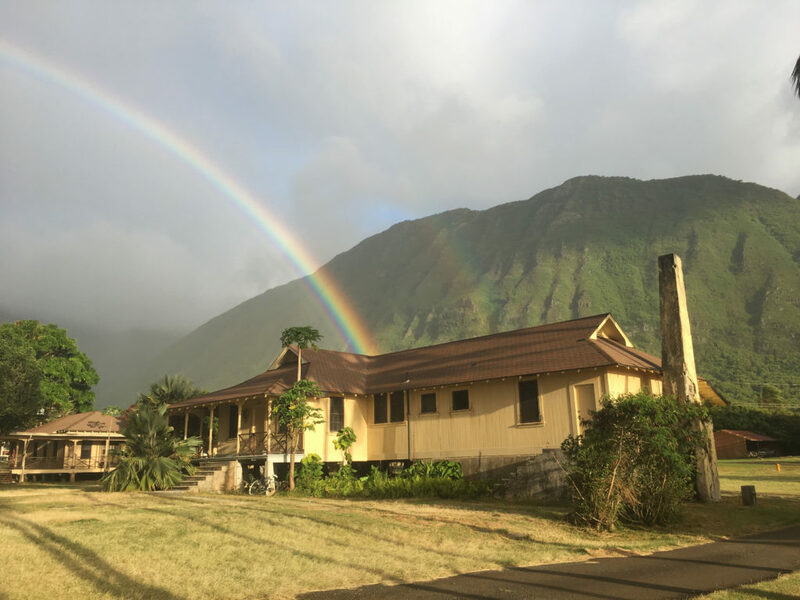 By 1949, forced isolation at Kalaupapa had ended and the lives of patients drastically changed as the new superintendent promoted social activities and lifted restrictions that prevented patients from holding jobs. Officially, the Hawaiian isolated policy was not abolished until 1969, at which time, patients were given the choice to remain or leave. Today, Hansen’s Disease, otherwise known as leprosy, is curable and is one of the least contagious of modern-day communicable diseases. In 1980, Kalaupapa National Historical Park was established to protect the remaining residents and preserve the history of the peninsula. Nine patients still remain in Kalaupapa with about 70 national park service and department of health employees. Upon arriving in the office on Monday morning, I met the natural resource management team and set out in search of green sea turtle nests with Alexandra Engler, a participant of the International Volunteers in the Parks Program, and Yubee Isaac, a UH Hilo National Historical Park Intern. Every morning, they checked the nearby black sand beach for nests. On average 5-6 nests are found per year at KALA, unfortunately, no nests had been observed this season. The remainder of my Monday was spent at sea. 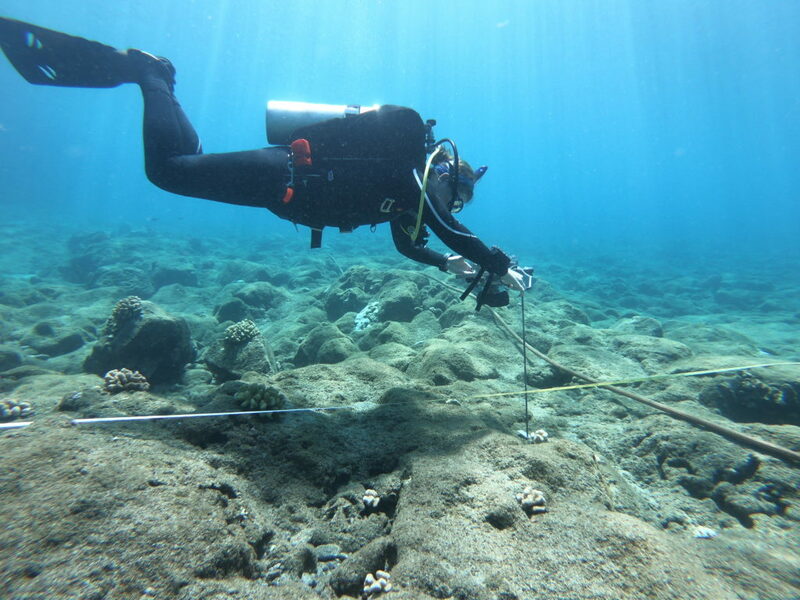 In partnership with the University of Hawai’i, acoustic receivers were placed in the waters surrounding KALA. In previous years, large pelagic fish and sharks were tagged with acoustic transmitters. When they swam near these strategically placed receivers, the movement of these apex predators was recorded and then studied. With the study complete, Randall Watanuki, a maintenance mechanic at KALA, and I spent the afternoon diving to remove these receivers. Using GPS coordinates, Randall and I would jump into the rough seas only to be met with a calm underwater environment that allowed us to quickly locate the receivers and unhook them from the ocean floor. 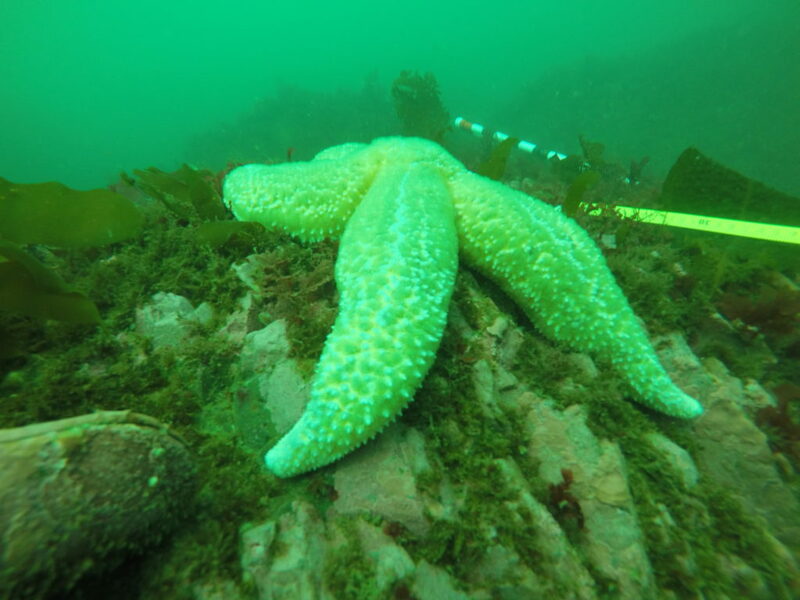 The following day was spent practicing the benthos and fish monitoring protocol that the marine team would employ later in the summer to monitor 30 sites around the peninsula. 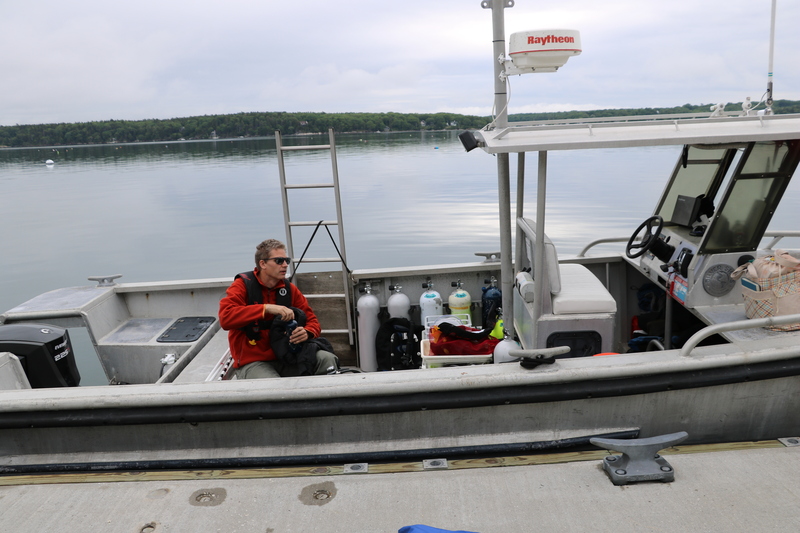 In the harbor, Eric laid five, 25 meter transects. Along each transect, Eric counted the number of fish and estimated their size. Fish density and species richness would be determined from this data. As Eric focused on fish counts, Randall and I took turns measuring rugosity with a chain and operating the camera. 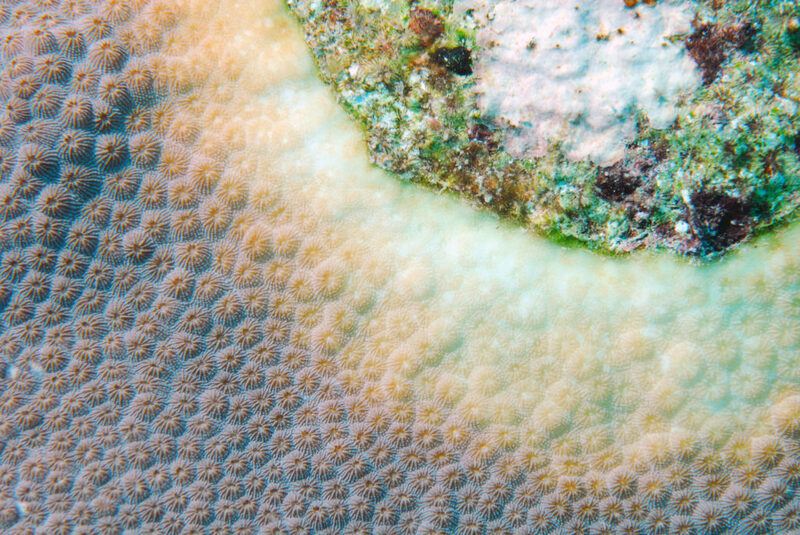 Photographs taken at every meter were analyzed to determine coral cover and disease prevalence. 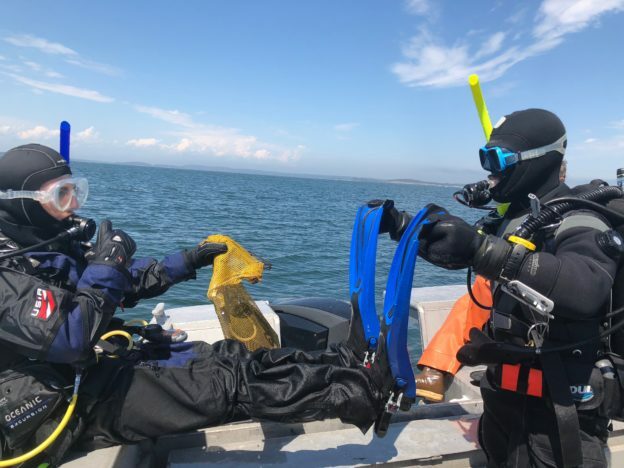 Though the harbor was a relatively barren, shallow habitat, the morning dive gave Eric and Randall a chance to refresh their skills in preparation for the busy monitoring season. On Wednesday morning, I accompanied Alex and Yubee as they monitored Kalaupapa’s monk seal (Neomonachus schauinslandi) population. Endemic to these islands, monk seals are an endangered species once almost hunted to extinction. 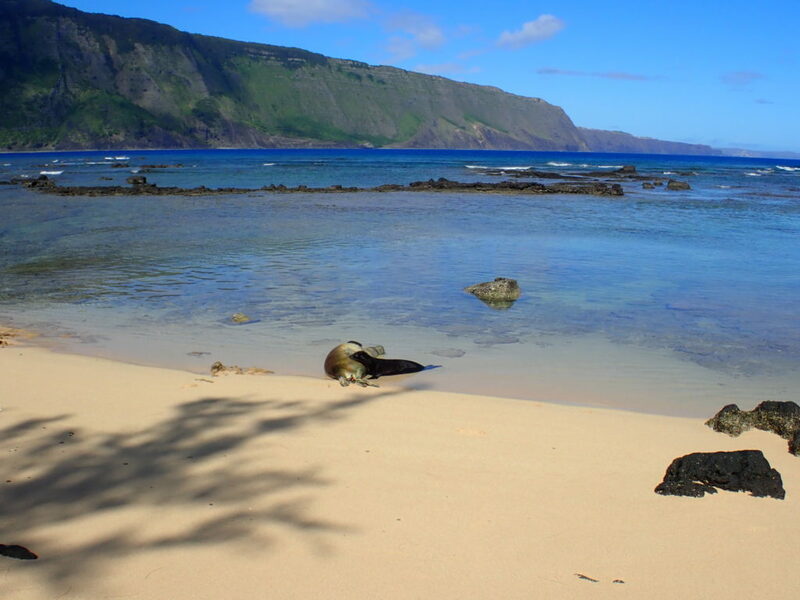 Currently, there are around 1,300 monks seals throughout the Hawaiian islands. To monitor the seals, Alex and Yubee walk along the beaches in search of the mother’s and their pups. Monk seals spend a majority of their lives in the water; however, females return to the beaches where they were born to give birth. They then remain on land with their pups for about 2 months before abandoning the pup and returning to sea. After being weaned, the marine team at KALA in association with NOAA Hawaiian Monk Seal Research Program, measure the pups, given them immunization shots, and tag their flippers so they can continue to monitor the pups as they grow. The purpose of these morning walks was to not only check in on KALA’s population but to determine whether any new pups were ready to be tagged. In the afternoon, Eric, Randall, and I completed a short, harbor dive to set up a mooring for the park boat. Due to the large swells and rocky shoreline, Eric wanted a place further from shore to attach the boat when necessary. This dive gave me the opportunity to observe some shallow maintenance work while exploring the nearby ecosystem. 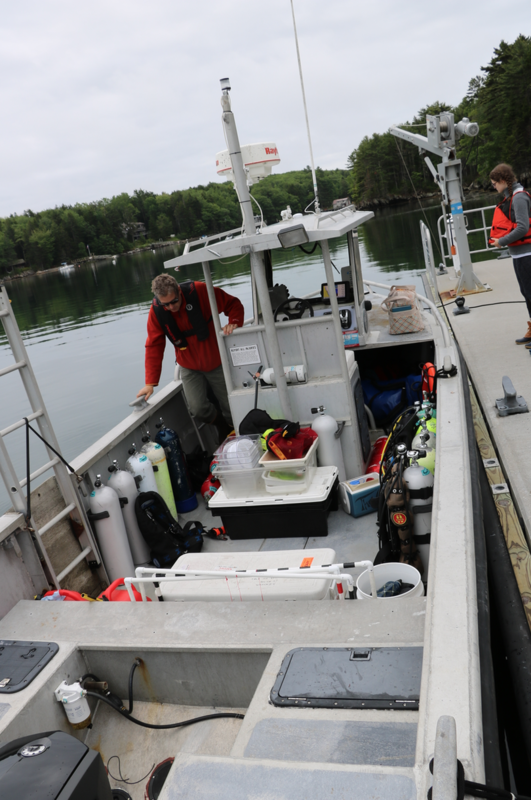 With more receivers to remove and water samples to collect, the marine team loaded the boat on Thursday morning and headed out for another adventure. Similar to our previous dives, Randall and I successfully collected three more receivers even after battling some strong surface currents. While Randall handled the tools, I controlled the line for the surface buoy that marked our location. In between dives, I assisted Eric, Randall, Yubee, and Alex as they collected water samples from three predetermined sites. At each site, a Niskin bottle was used to collect water from the surface. The samples were filtered and then stored for later analysis. 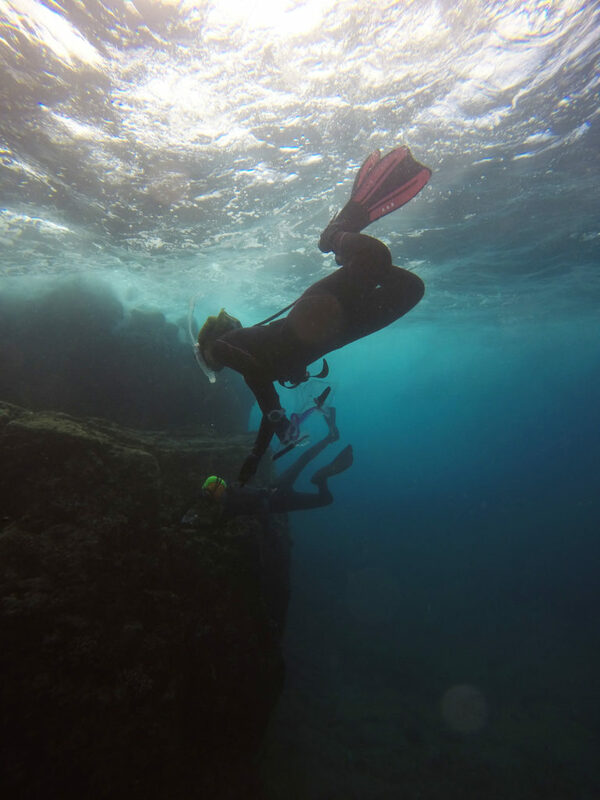 Two snorkelers would also enter the water at each site. 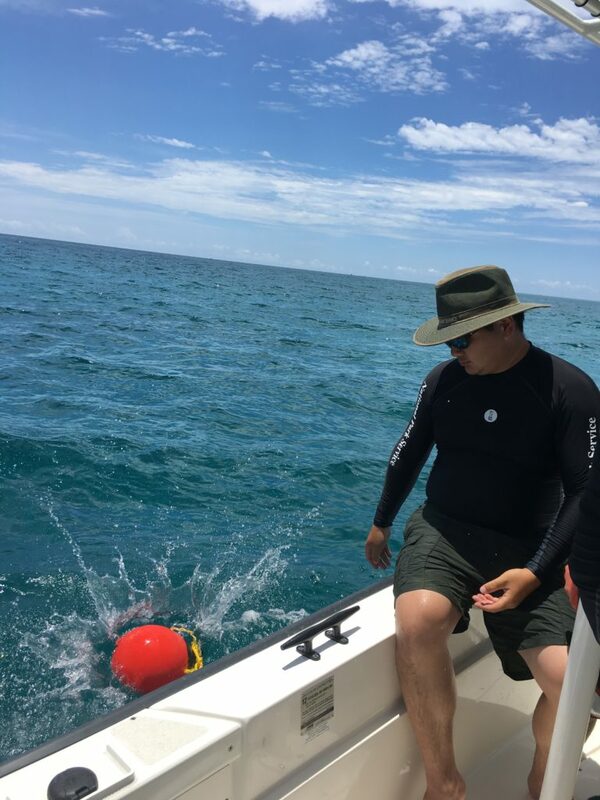 With a multiparameter instrument attached to a float, they would lower the device to depth to collect data such as water salinity and temperature. 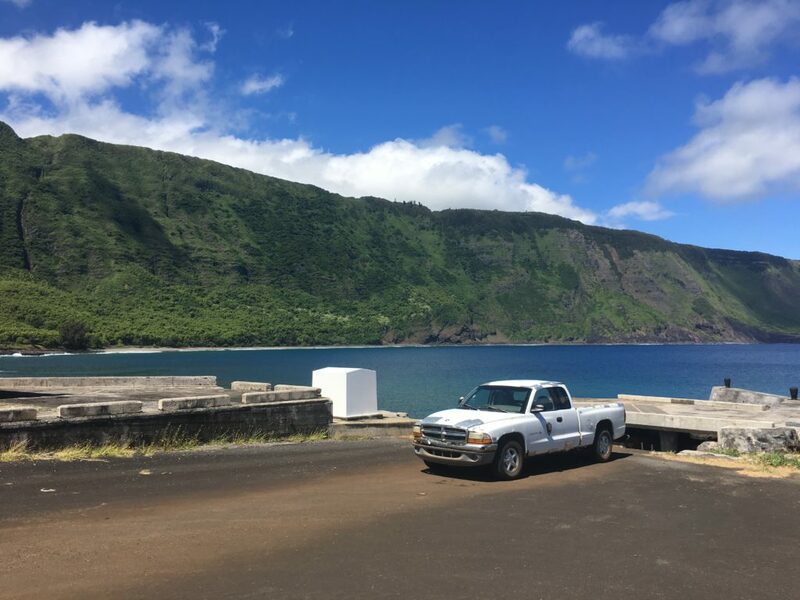 Water quality data collected around Kalaupapa’s peninsula allows Eric to monitor any water chemistry trends that may influence the marine ecosystem. Meet Esmeralda. This rusty truck belongs to the marine team and is used to carry scuba gear to and from the docks. When the barge arrives this summer, the team will say farewell and a new truck will take Esmeralda’s place. Upon returning to shore and drying our gear, Alex and Yubee were kind enough to invite me over to their home for the evening. Staff Row, built between 1890 and 1930, originally served as housing for the medical professionals living at the settlement. Today, these buildings are home to a group of interns working for the National Park Service. We spent the evening trading stories as we enjoyed an outstanding ratatouille dish cooked by Alex. 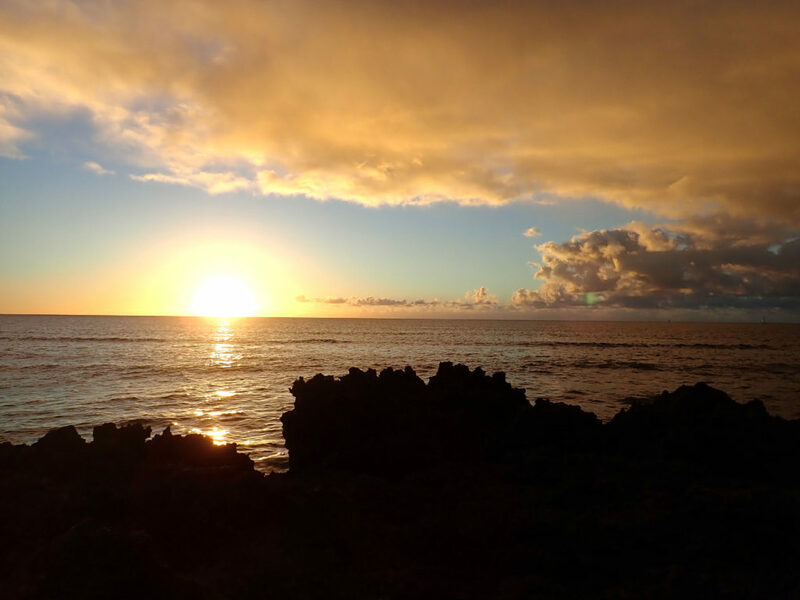 While our work week was behind us, Yubee, Alex, and I awoke early the next morning to begin our hike to the topside of Molokai. 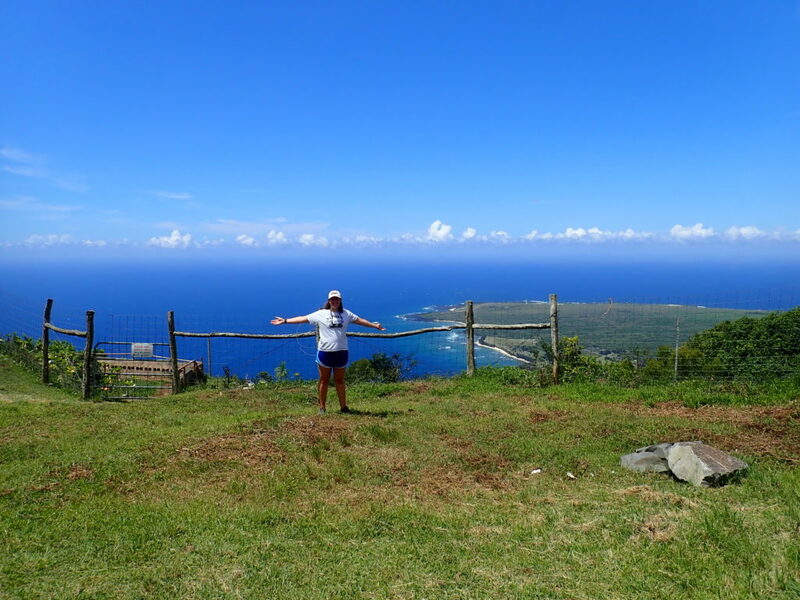 Kalaupapa National Historical Park is accessible by plane or by a single hiking trail. The trail is around 3 miles, 1,600 feet, and has 26 switchbacks. No roads connect the small settlement of KALA to the 7,500 people living on the other side of Molokai. Many inhabitants of KALA, hike this trail multiple times a week to get groceries, visit topside, and/or live with their families who reside topside. Unlike Eric, whose impressive trek takes less than an hour, Alex was patient as Yubee and I took our time. We were enjoying the scenery while simultaneously catching our breaths. 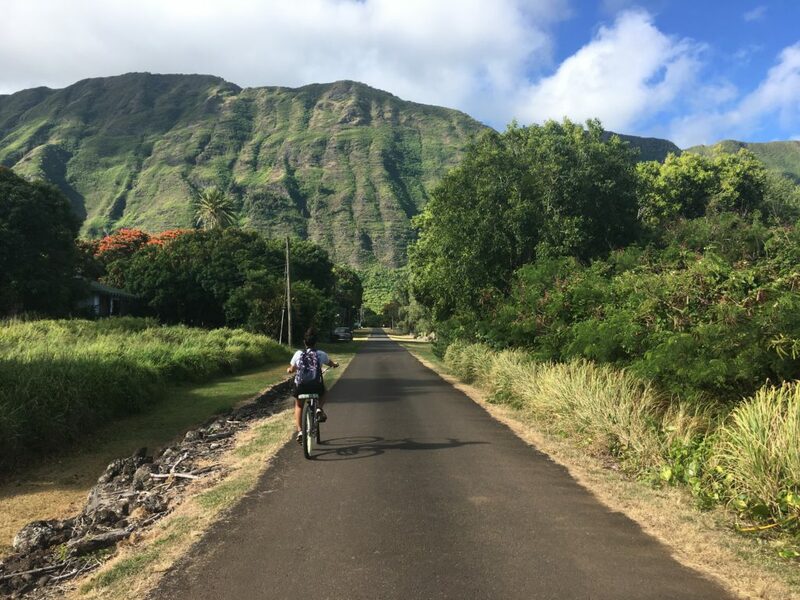 Upon reaching the top of the trial, Eric drove a group of us down 10 miles to Kaunakakai, the largest town on the island, home to two grocery stores. There we explored the small, lively town while filling our bags with groceries and our stomachs with ice cream. After returning to the settlement, that evening, I joined several members of the community for their weekly potluck and movie night at Tim’s house. Tim is the chef for the nine patients who remain on the peninsula. 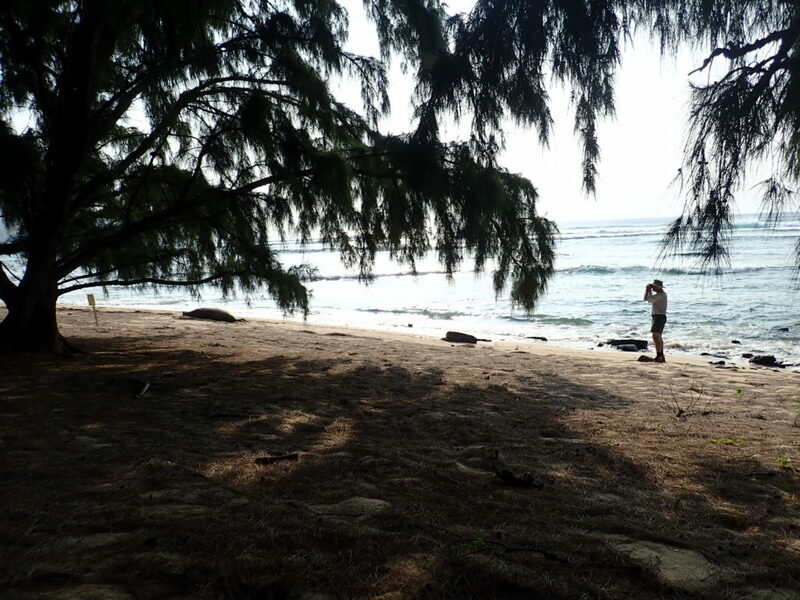 After enjoying a relaxing Saturday morning, I accompanied Eric on a weekly monk seal walk. 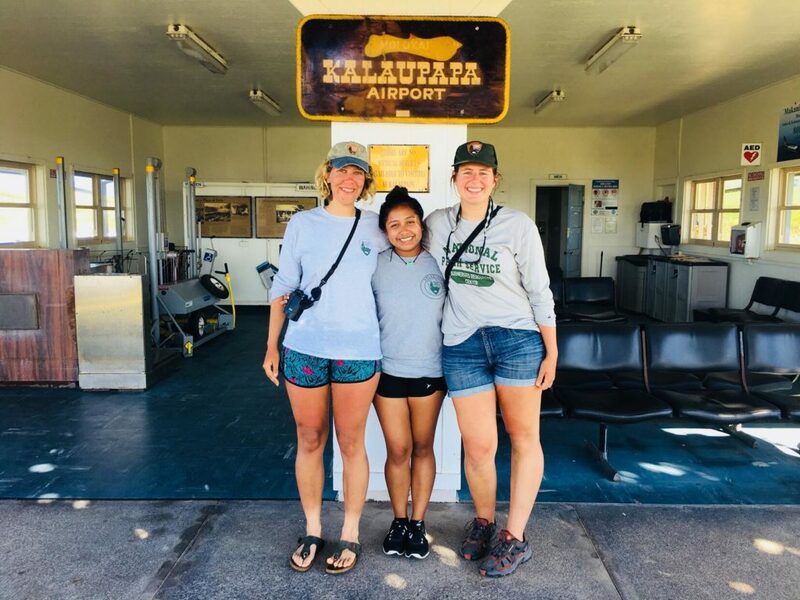 Starting at the Kalaupapa airport and ending at the harbor, we walked along the shoreline to count the monk seals, record their activity and habitat. To prevent seals from becoming accustomed to humans, we stayed low and avoided eye contact. During the walk, we observed three nursing mothers, a pregnant female, and multiple weaned pups playing in the shallows. 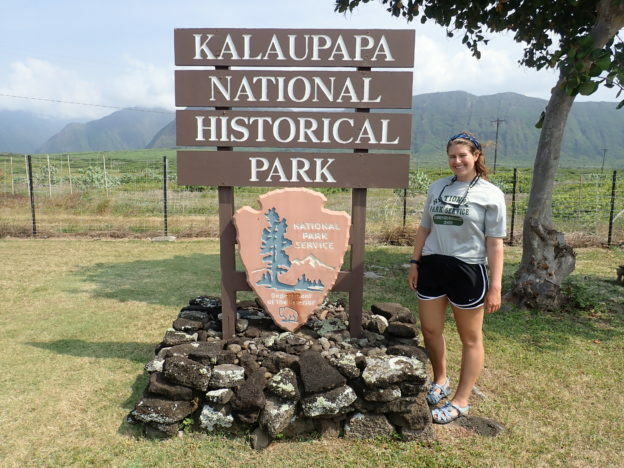 Monday morning marked my second to last day at Kalaupapa National Historical Park. In the morning, I assisted Randall as we filled the boat’s gas tank. Due to a sizable swell, we were unable to pull the boat against the dock. Instead, Randall and I swam three gas tanks out to the boat. Upon returning to headquarters, we were greeted by Erika Johnston, ‘Ale’alani Duboit, and Emily Conklin. All three are Ph.D. candidates in the Toonen-Bowen lab at the University of Hawai’i at Manoa. 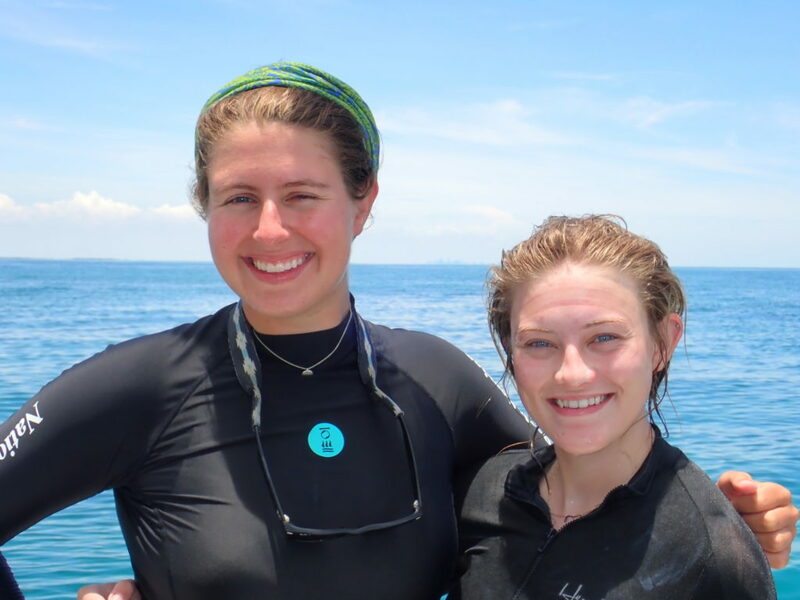 For the next week, they would be freediving and collecting samples of two native coral species for a connectivity study. We spent their first day in the field at two sites. 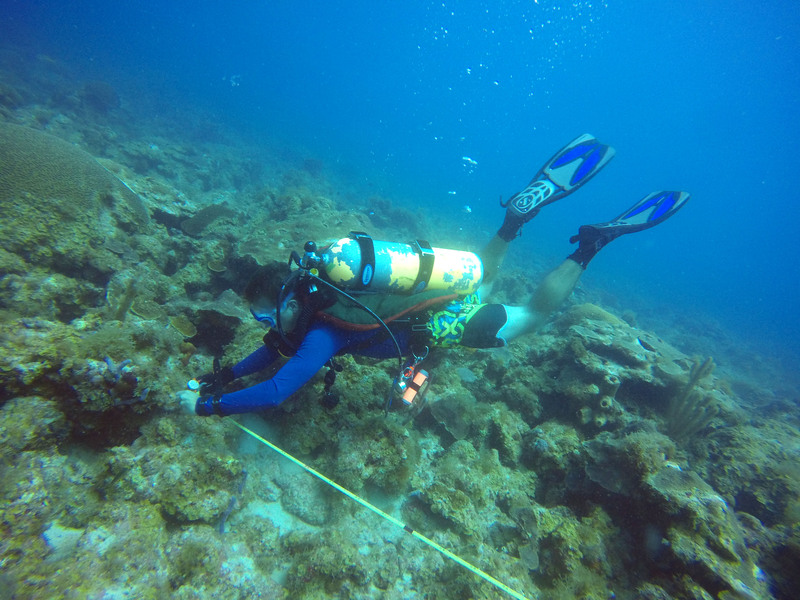 At each site, we collected ~20 samples of each species from separate coral colonies located around 15-20 feet deep. My final morning at KALA was spent at the settlement’s nursery. Alongside Ryan, a volunteer for the terrestrial team at KALA, Yubee and I helped transfer juvenile plants to individual containers so they could grow freely. 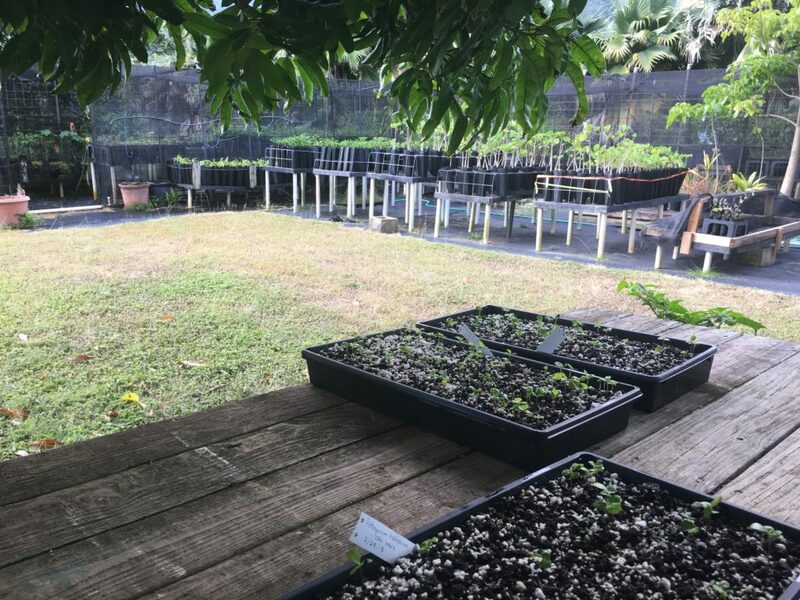 While the nursery was filled with native plants, most of Kalaupapa’s peninsula is inhabited by non-native species. Pittosporum halophilum (native coastal species) and Reynoldsia sandwicensis (native crater species) were the two species we transferred. After growing in the nursery, these plants would be transferred by the terrestrial team to their natural habitats. While the re-introduction of these native species at the crater had worked well due to their fenced environment, the plants sent to the coastline of KALA had seen limited success due to deer predation. After our trip in search of the pregnant monk seal ended with no success, Eric, Yubee, Alex, and I jumped into the trunk and headed to the airport. 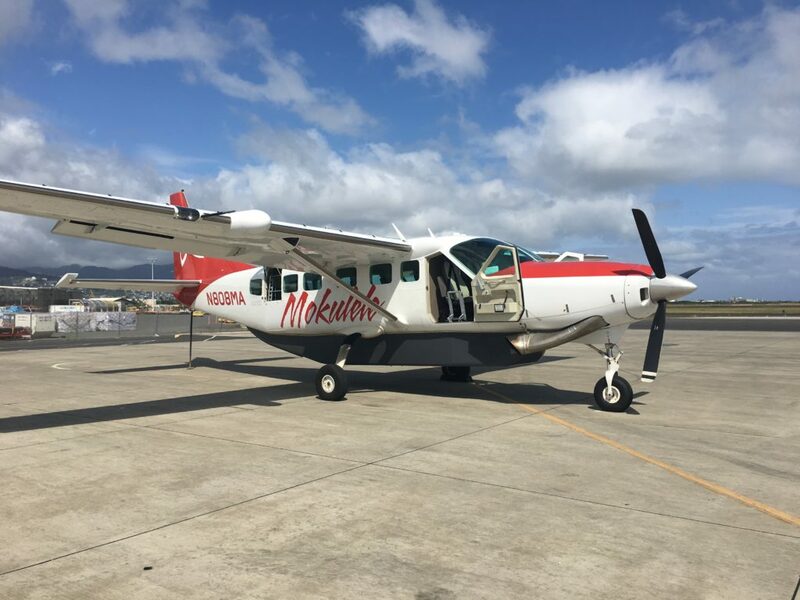 With my baggage in tow, I climbed into the small plane, this time crowded with seven other passengers and headed back to Honolulu, Hawaii. Before returning to the mainland, I would spend the next four days at World War II Valor in the Pacific National Monument. Thanks to the amazing team at Kalaupapa National Historical Park for welcoming me with open arms. You made me feel like a member of the community, and I look forward to hopefully returning in the future! 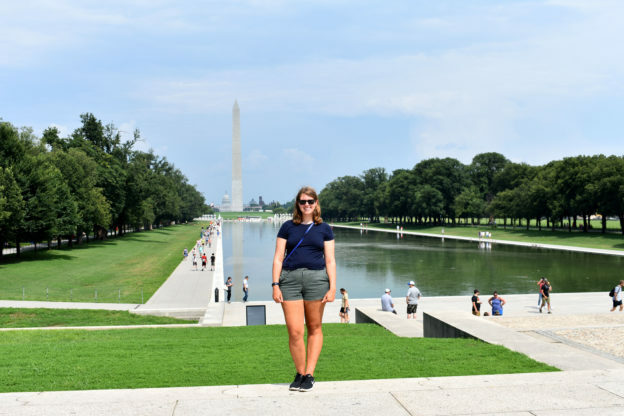 This entry was posted in 2018 National Park Service, Current Internships on August 2, 2018 by Shannon Brown. ￼This week was dive intensive. Early in the week, Monday and Tuesday, I finished digitizing the old kelp data thus making it possible for Courtney to make maps of the kelp using geographic information systems (GIS) using ArcMap to visualize the data. Using these maps, we can see that kelp is moving further north to colder waters, along with a change in species composition. Cold water species such as Alaria esculenta are virtually non-existent in the warmer southern waters which are predominantly inhabited by other species like Saccharina latissima and Laminaria digitata. 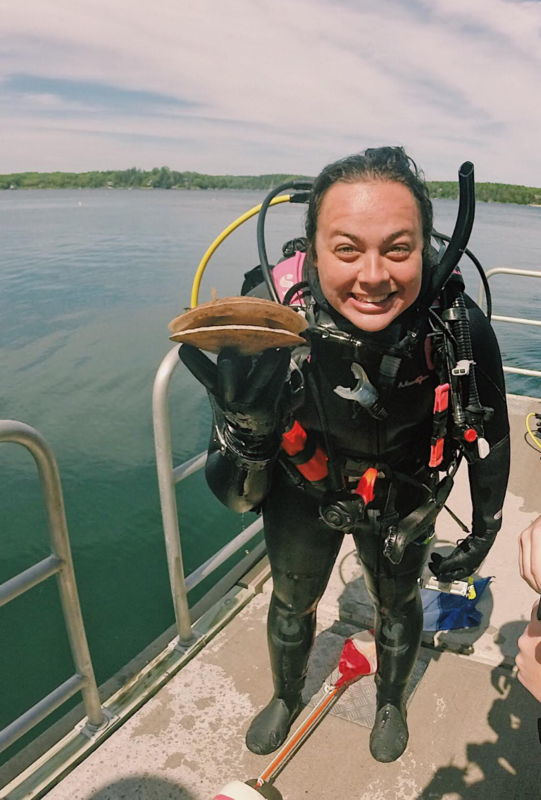 Hattie, a dive master for the AAUS class, having some fun with a giant scallop! On Wednesday I had my third AAUS class. This class is always a highlight of the week due to the close community we have formed in such a short period. With only six people in the class, three instructors and three students, it is a more intimate and fun atmosphere with jokes and laughter flowing each day. Chris keeps the class upbeat but keeps us focused on learning and our diving tasks for the day. This Wednesday we headed to my neck of the woods, Bigelow Labs, to complete a dock dive from their property in the Damariscotta River. The purpose of these dives was to plan and execute a multi-level dive starting at 45 feet and progressing upwards. Bigelow is uniquely suited for a dive like this, right off their dock is 20-30 feet of water and a short 20-foot swim will drop you into 60 feet. We completed two multi-level dives while getting to experience a different environment from our previous dive site Sand Cove. 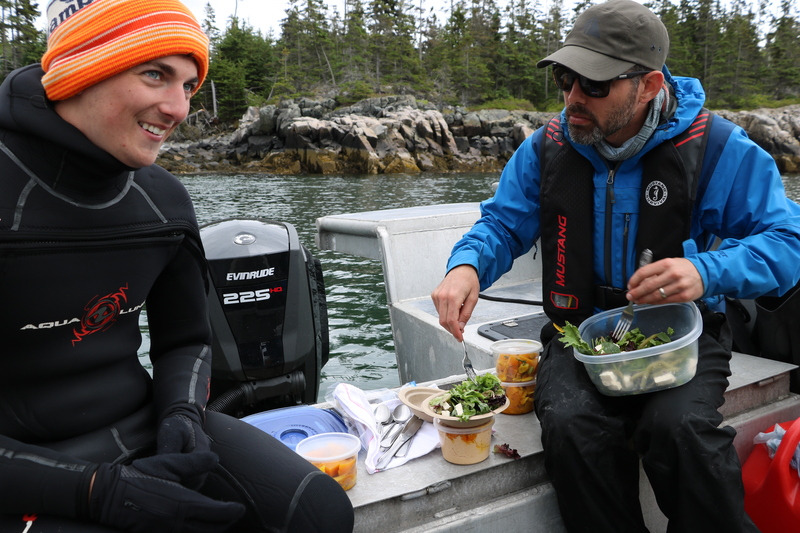 We saw massive kelp, five to six feet long, and giant scallops almost the size of dinner plates. Lobsters, Jonah crabs, and Green Crabs inhabit every crack and crevice. Thursday was finally my first true scientific dive a Bigelow! 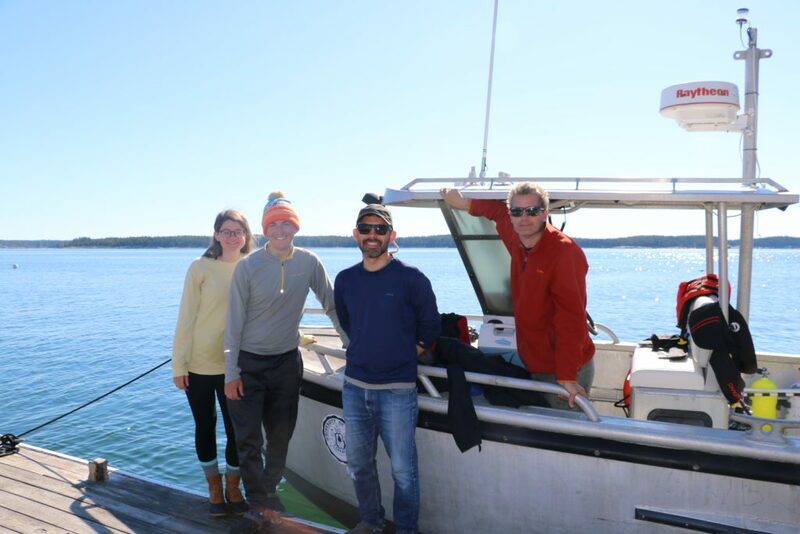 We woke up early and prepared the gear and loaded the boat to be on the water by 8:00 a.m. We had four dives planned for the day – two dives at Damariscove, one at 10 meters the other at 5 meters, while two more dives at Pemaquid at the same depth profiles. We will be sampling these two sites plus 18 others this summer. Each site has been sampled back in 2004 with little knowledge about the changes over the last 14 years. 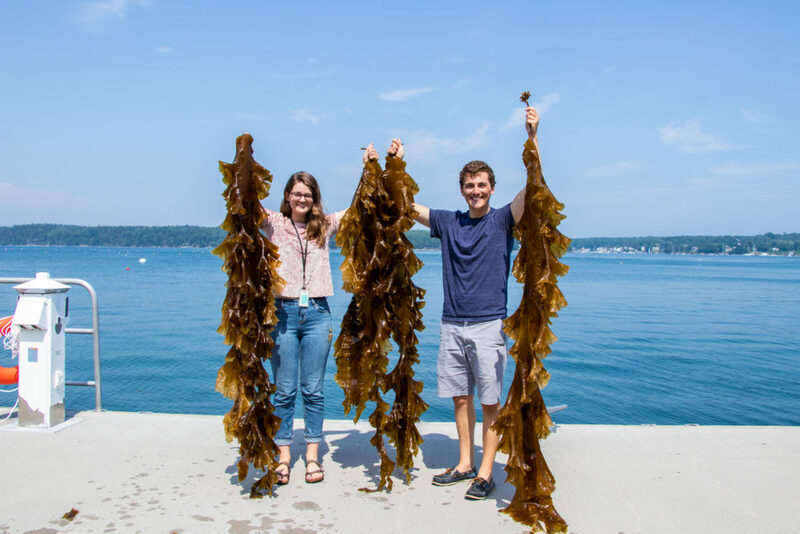 The return of these kelp beds to Maine have been understudied in the past years. The aquatic ecosystem in Maine long ago was a more diverse system with many trophic levels and a complex food web. 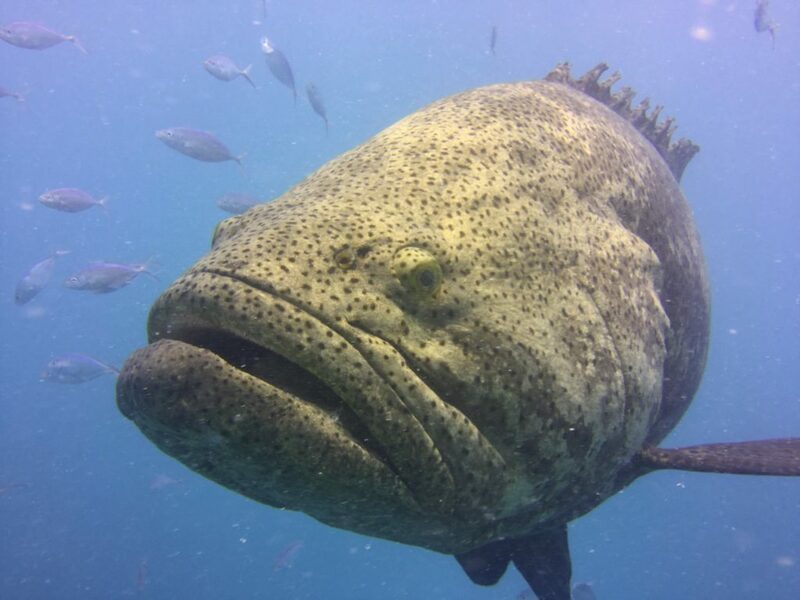 Cod was a top predator eating smaller fish and keeping the sea urchin population at bay. However, in the 1950s we started fishing cod and nearly fished cod to extinction in the 1990s. 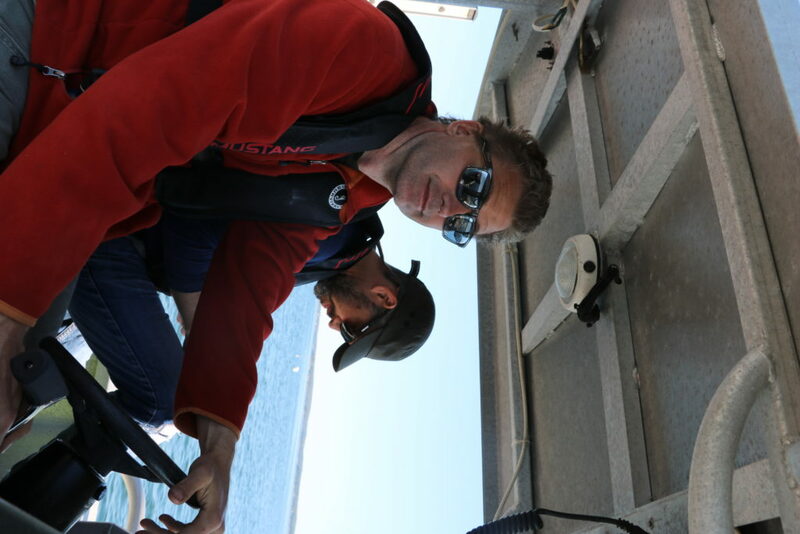 Without these top predators left in the waters of Maine, sea urchin population spiked. Sea urchins are incredible but destructive organisms. Their appetite is unquenchable; urchins can eat 2-4 percent of their body weight each day! Sea urchins also have a preferred food of choice: kelp. Thus, with the fall of cod and the spike in urchin populations, kelp was quickly being eaten and obliterated by the urchins. 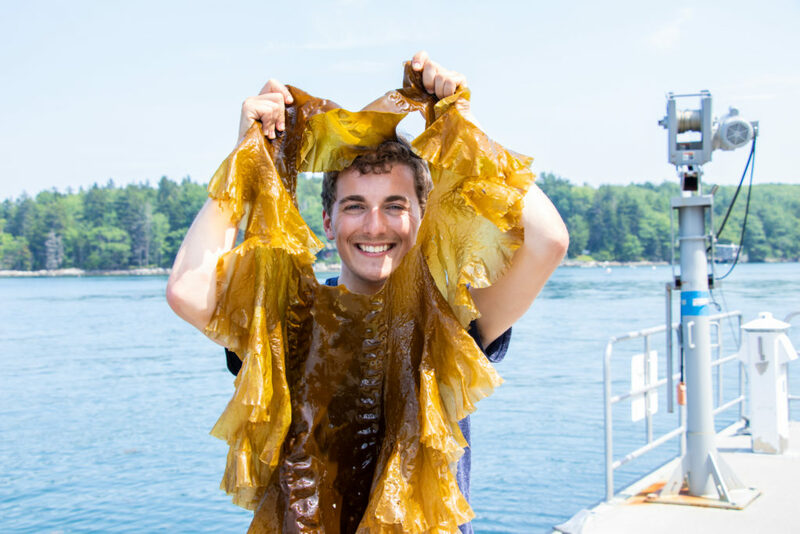 In 15 years kelp beds, like cod, were gone leaving empty sand and rock patches with only urchins, known as “urchin barrens.” However, Mainers are resourceful and like to make money. Urchins and their gonads are a valuable delicacy in Asia and quickly people started to dive and snorkel for these small spiny creatures. The business was so lucrative and easy that in less than ten years Mainers had fished almost all the sea urchins from the Gulf of Maine. In those ten years, it is estimated that 250,000,000 urchins were taken from Maine’s waters! 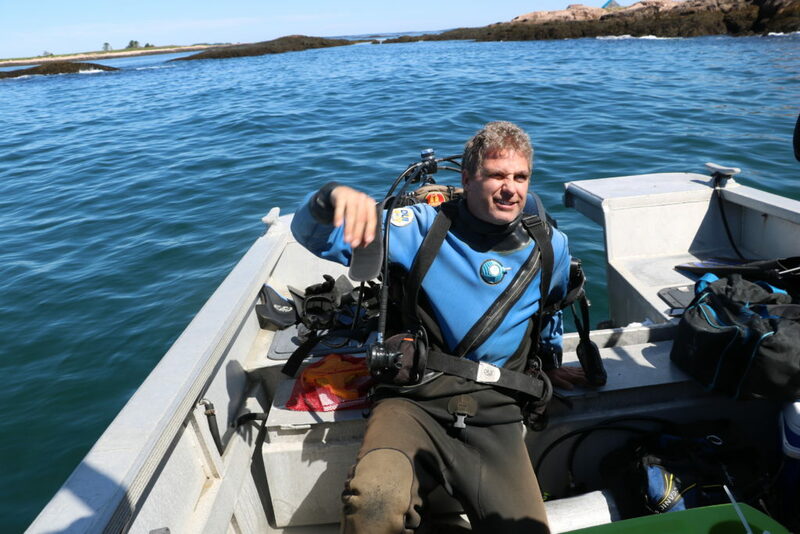 With the decimation of the urchins, kelps soon started to return to the Gulf of Maine. And here we are today, kelps are returning, yet no one really knows how much has returned, which species returned, and what proportion of species make up these kelp beds. These questions, along with others, are the questions that Doug and Thew are trying to answer. 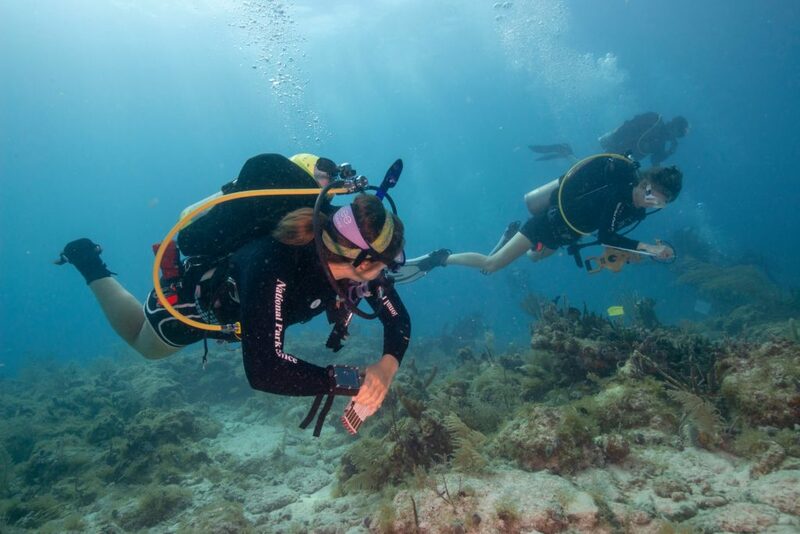 To answer these complex ecological question means collecting data, and collecting data means getting in the water, and getting in the water means SCUBA diving! Now my summer has really begun! While I’m in the water, Courtney starts handing me collection bags, and quadrats from the boat. The dives at Damariscove and Pemaquid were an entirely new experience for me. 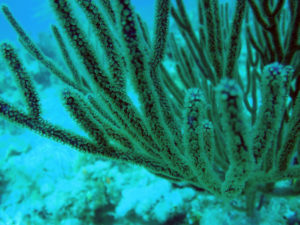 Unlike recreational dive, scientific diving has a unique feel to it. You have a mission, an objective, and you are simply using SCUBA to accomplish that goal. 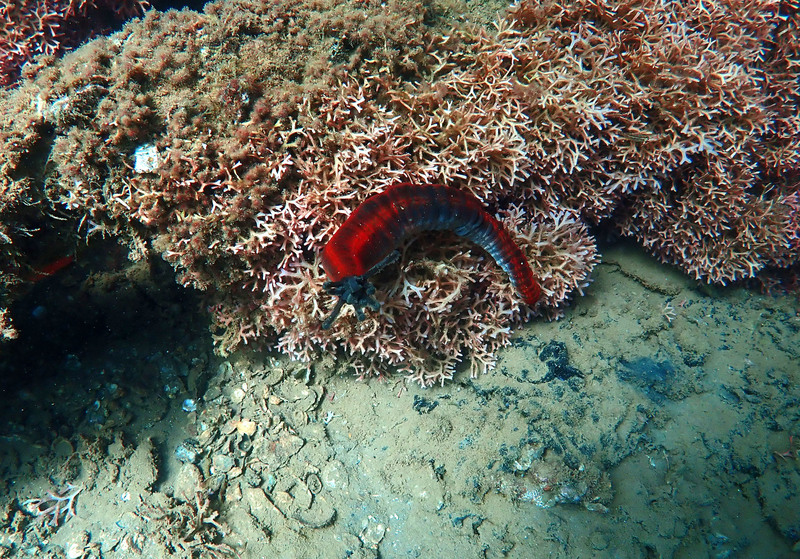 You aren’t diving for the pleasure of seeing kelp beds and lobster, although it’s a bonus if you like the work! On each dive, I am either diving with Doug or Thew while the other stays on the boat as surface support. Each diver is loaded with gear for the dive: writing slates with underwater paper, collection bags, transect tapes, and quadrats. A bit cumbersome on land and the surface, but underwater it is manageable. 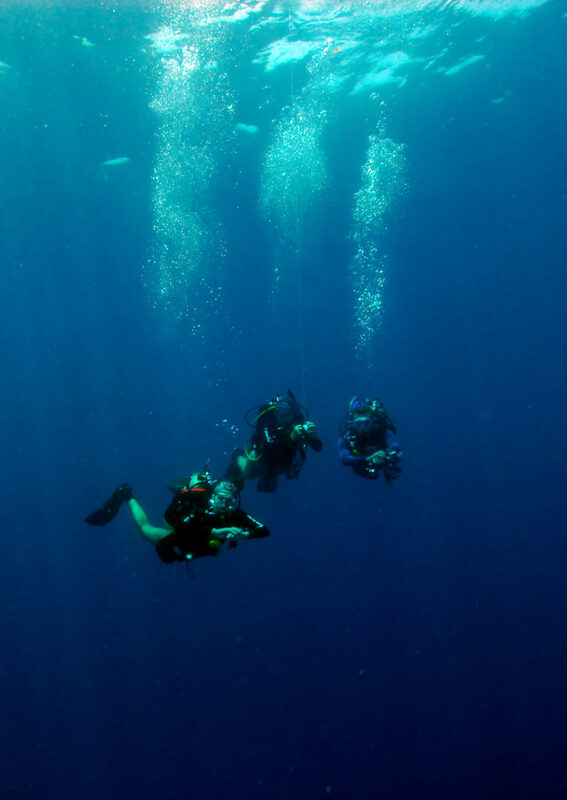 All dives start with a descent down the anchor line to the bottom. Depending on those ten-foot tides it could be anywhere from 30 to 45 feet. Once we reach the bottom, we either are directly over a kelp bed or swim a few meters to the start of one. I wait at the starting point while the other diver runs the 10-meter transect across the bottom. While the other dive is doing that, I place one of the half-meter quadrats at the two-meter mark. 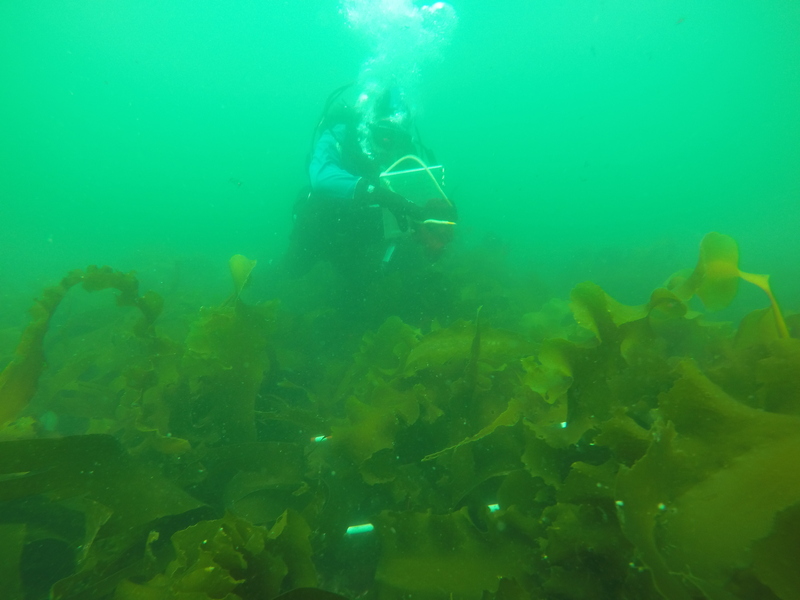 After laying the transect line, Doug or Thew will come to that first quadrat to begin analyzing and quantifying everything inside, including percent cover of the different kelp species. They will record the type of substrate these seaweeds are growing on and if there are any crab or lobster in the quadrats. After they are done they will move to the left side of the two-meter mark on the transect, then the right side at 4 meters, left side at 4 meters, doing this until they reach 8 meters. Thew trying to record percent coverage of different seaweeds in the quadrat. After they record their data I come in and place my quadrat in the same place and begin to collect all the kelp in the quadrat. Kelp can be as big as 6-7ft or as small as an inch. Each kelp is put in a collection bag and will be later measured and weighted. Not only do I collect all the kelp I also collect all of the small understory, the small little seaweeds that cover the bottom. After both divers collect their data we pick up the transect and ascend back to the surface. We will take a short break moving to the next depth or site while getting new collection bags ready and fresh sheets of underwater paper. The dives themselves take anywhere from 25 minutes to 1 hour. We left Bigelow at 8 a.m. and were back by 4 p.m. The water was cold, only 52F, and doing all four dives can get pretty cold. I have been graciously gifted a drysuit by USIA however, at this point it is being shipped to me, thus I’m diving a 7/8mm semi-dry which tests my fortitude. Being wet and in 50-degree water for 6 hours at a time is definitely an experience. But I love it. 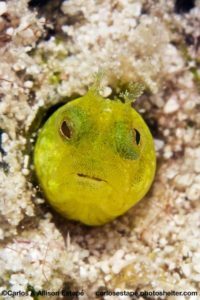 That’s why I came here to dive, and there was plenty happening this week. 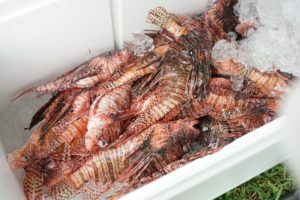 After our one-day dive trip, we had Friday to process the samples I had collected and prep for a three-day research cruise to Hurricane Island. Hurricane Island is 10 miles southeast of Rockland and two miles southwest of Vinalhaven in the Fox Islands archipelago, Penobscot Bay, Maine. 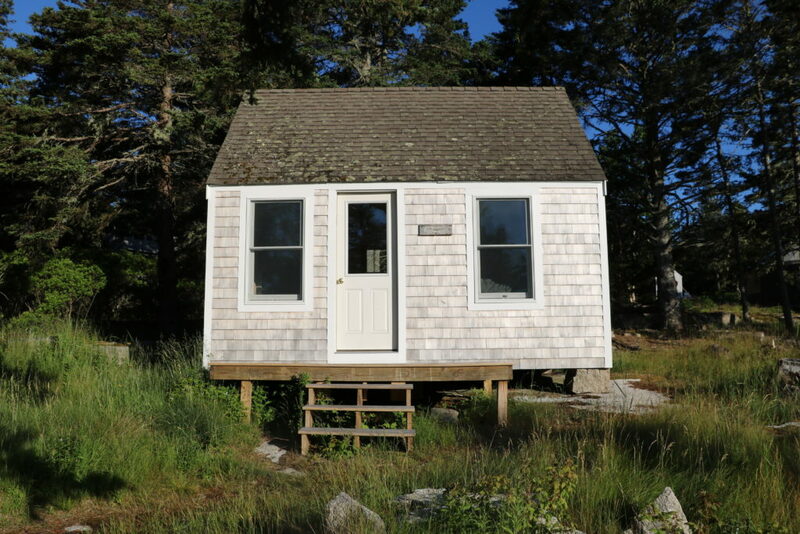 The island has a small staff along with cabins which provide hands-on education programs and research opportunities focusing on marine sciences, for all ages from middle school to adults. The island is run completely of the grid, with solar panels generating the electricity and a gravity fed pump for water. The simplicity of the island is charming. Loading the Silver Sides for our trip to Hurricane Island. A fully load boat! 18 tanks, 3 sets of dive gear, sorting geat, and our clothing. Our three-day trip, Sunday-Tuesday, was a work-filled fun time. Going on the trip was the usual crew: Doug, Thew, Courtney, and I. We woke up early and loaded our trusty boat, the RV Silver Sides, and started on the 1.5hr ride to Hurricane. After getting there we immediately unloaded our essential research gear and got a quick tour of the facilities. Doug has an “in” at Hurricane, Phoebe Jekielek, the Program Director for the Island. 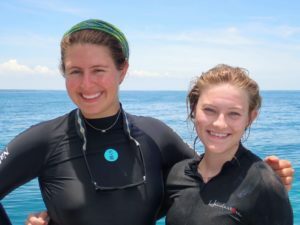 They were good friends in the early stages of their careers at the Marine Darling Center. Phoebe is this wildly funny, free spirited person with a smile that is contagious. After our dives when we would sort our samples, she would come to hang out and tell stories of when Doug and she were younger and all the “shenanigans” they got into. So after our quick tour, we jumped in the boat to go on our dives for the day. Similarly to our last dive outing, we would be sampling two sites and two depth using the sample procedure and protocols as before. It was nice to have Courtney on the boat, as an extra set of hands to help out. After a couple of long hours, we headed back to Hurricane. Late night sorting. 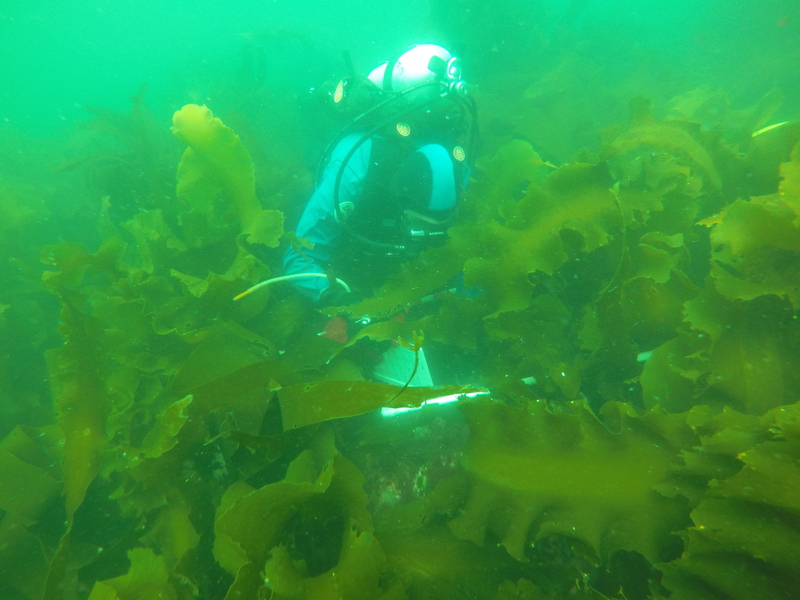 Thew measures and weighs each kelp, Courtney sorts the understory, Doug trying to key out the similar looking species, and I record the species weights and length. Processing samples can take anywhere from 2-4 hours so good music and a speaker is key! A goat cheese salad, with fresh beets along with crackers and hummus — yum. Serendipitously, that Sunday Hurricane Island was providing a farm to table dinner, one of three they put on for the community in the summer. This white tablecloth, five-course meal, was the talk of the town and somehow Phoebe squeezed us four grubby scientists on the guest list. When we unloaded the boat we looked like a motley crew, wet, tired, dirty, and even slimy from our kelps. None of us packed nice clothes for such an occasion making this event even more comical. We cleaned up as best we could and dressed to the nines (jeans with ripped holes, and rain coats) sat for an amazing meal. Seared scallops, kale salad, halibut, pork and polenta, and rhubarb cake. Doug and Thew continuously reminded Courtney and me that this is never how nice research trips usually are and we should be extremely lucky. After the dinner was over we all slowly and painfully and to leave to process our samples, sorting, identifying, measuring and weighing kelps and seaweeds into the night. Monday was the same plan, get up, dive, and process samples. Hurricane provides it residents breakfast, lunch, and dinner, all of which are high quality and fresh meals. Although they aren’t five-course meals we still were spoiled. They even packed us an amazing lunch of salad, beets, hummus, and crackers. The largest piece of kelp from the trip! A sea star with Doug working in the background. Doug waiting at our safety stop — 15ft for 3 minutes. Our simple but wonderful accommodations. 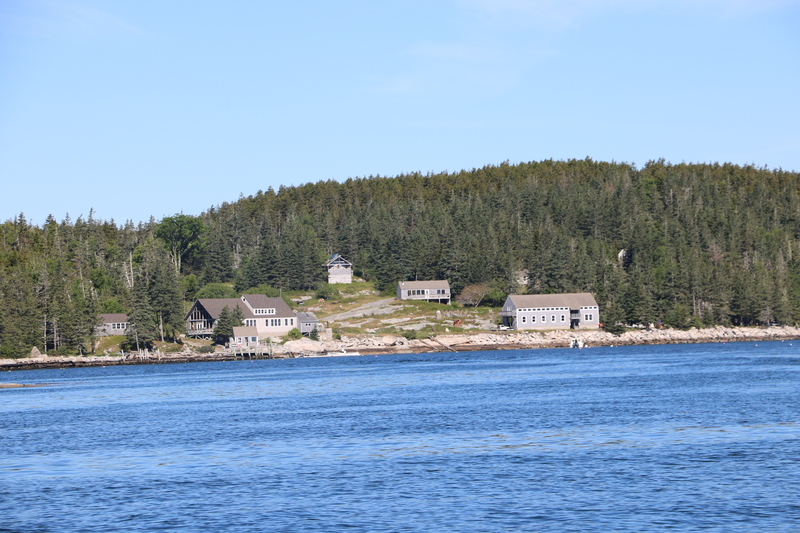 Next week we will take a day trip to Monhegan and Allen island and I have AAUS class. During the week, we will be preparing for our down east trip which should bring lots of diving and stories. Thank you to Pheobe for being an amazing host at Hurricane and to Courtney for the GIS maps. Thank you OWUSS and AAUS. This entry was posted in 2018 Somers AAUS, Internship Journeys on July 22, 2018 by Shane Farrell.